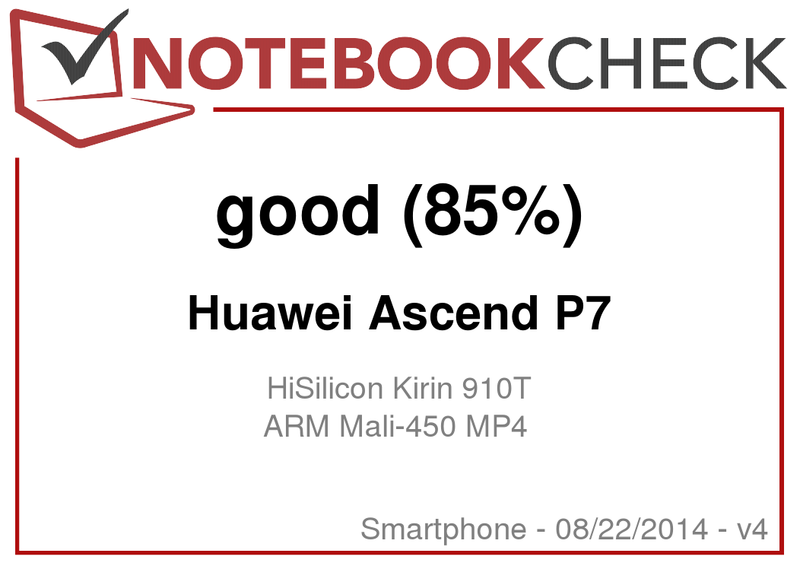 Update as of the 08/22/2014: It turns out that the te Huawei Ascend P7 cheats in relevant benchmarks. That's what the colleagues from Anandtech found out. In short, clock speed of the CPU cores in different benchmarks remains considerably longer at is maximum value of 1.8 GHz as compared to standard operation. With renamed APKs this difference can be also measured. In the GFX Benchmark 2.7, the difference amounts to around 16%, in the 3DMark 2013 Ice Storm Unlimited to even 30%. 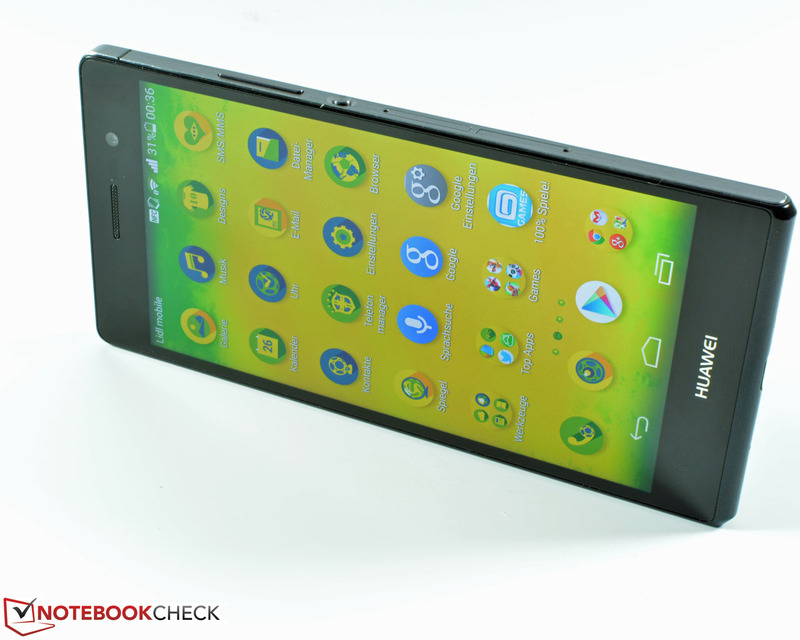 Due to this insight we downgraded the Huawei Ascend P7 in the performance rating. 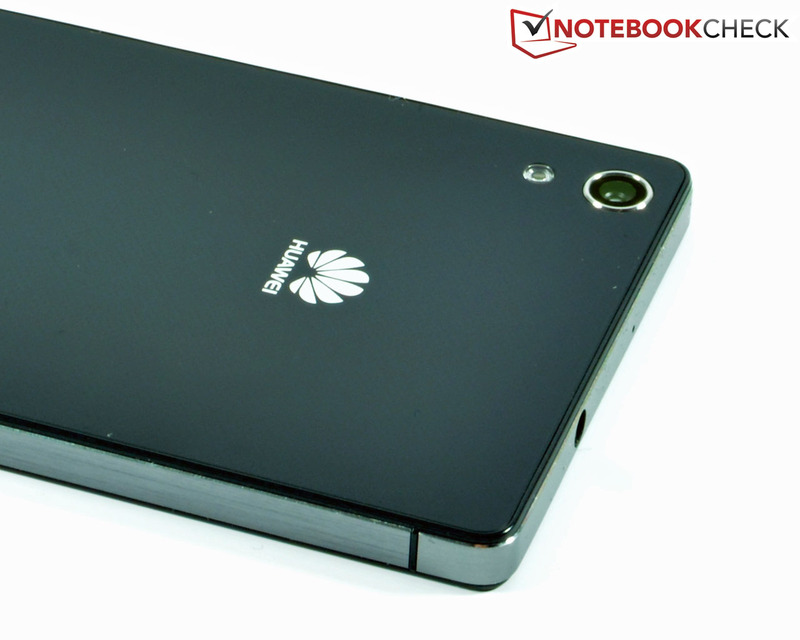 Last year Huawei placed a claim on a juicy piece of the premium cake with its Ascend P6 and reaped in a good rating. Now the Chinese manufacture turns up the heat and announces a new challenge with the Huawei Ascend P7. The Ascend P7 wants to break with all conventions. Though the smartphone looks virtually the same as its precursor, it now relies on a 5-inch touchscreen rather than the 4.7-inch counterpart in the Ascend P6. Its outsides have only undergone a minor facelift, but the real differences are, as so often is the case, underneath the admittedly elegant surface. The P7 trusts a brand new quad-core SoC from HiSilicon dubbed Kirin 910T with an integrated Mali-450 MP4 graphics card and 2 GB of RAM. Besides that, 16 GB of flash storage and a microSD slot are installed. 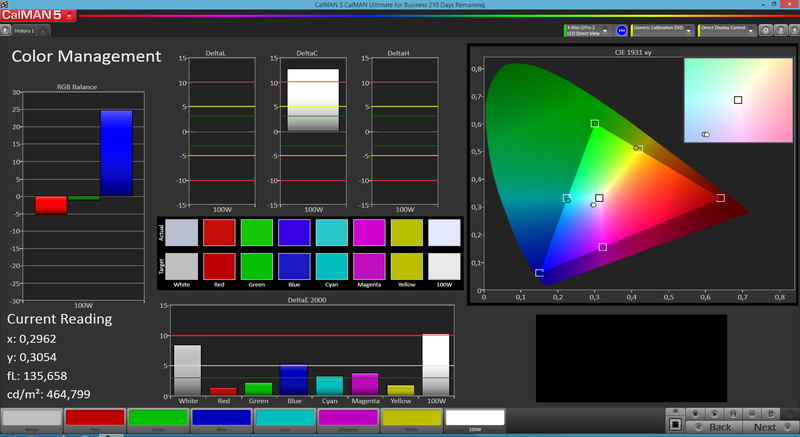 The IPS screen now has a Full HD resolution. That already sounds quite functional, yet Huawei cannot compete with the latest phones from HTC, Samsung, Sony or Apple technically. However, Huawei only demands 449 Euros (~$600, RRP) for its Ascend P7 - an affordable entry into the upper mid-range. Consequently, the Apple iPhone 5c, BlackBerry Z30, Google Nexus 5, LG G2, and Samsung Galaxy S4 can be seen as contenders. We also used Samsung's Galaxy S5 for comparison, being the current reference in our Top 10. The casing's looks and build quality are very like that of the iPhone 5s. Huawei has not modified the casing much - there was no need because it was already really good in the precursor. Aluminum and glass are still the prevailing materials. Some details have been refreshed though. 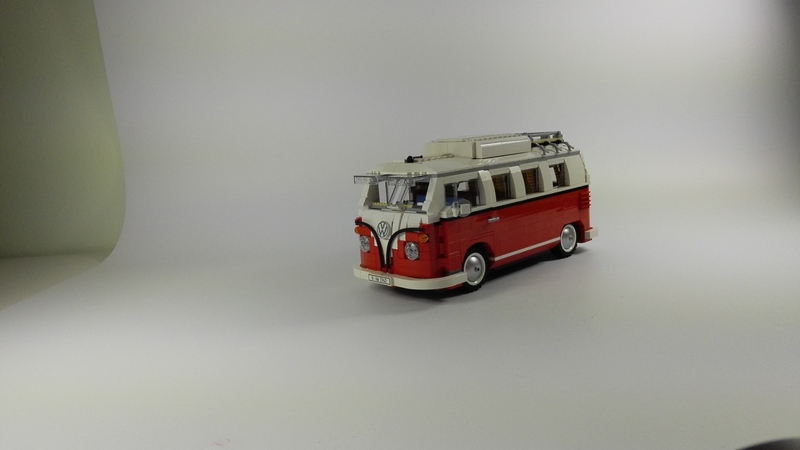 For example, the lower edge has been marginally streamlined. The design looks elegant and timeless. 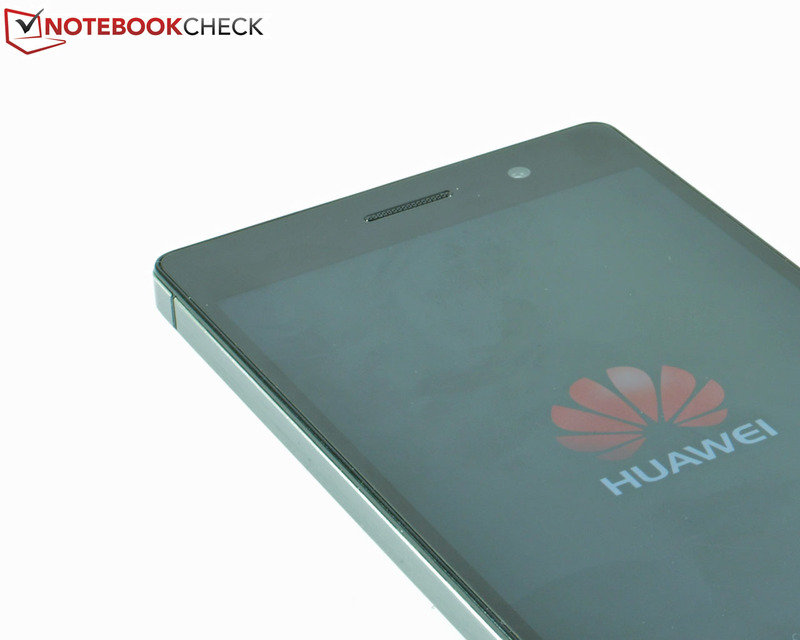 Huawei limits the choice of color; the P7 is now only available in black or white. The precursor's pink edition has been deleted without substitution. The casing's excellent build and the high stiffness have been adopted. The screen's surface is made of scratch-resistant Corning Gorilla Glass 3 that even defies strong pressure. The smartphone's dimensions of 139.8 x 68.8 mm are quite compact for the screen size. 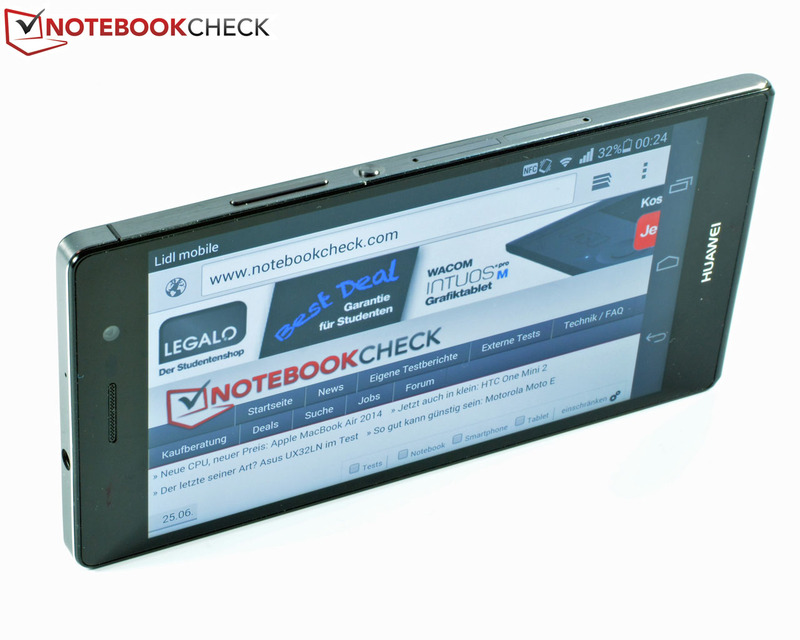 It has a height of just 6.5 mm and is thus thinner than all contenders. 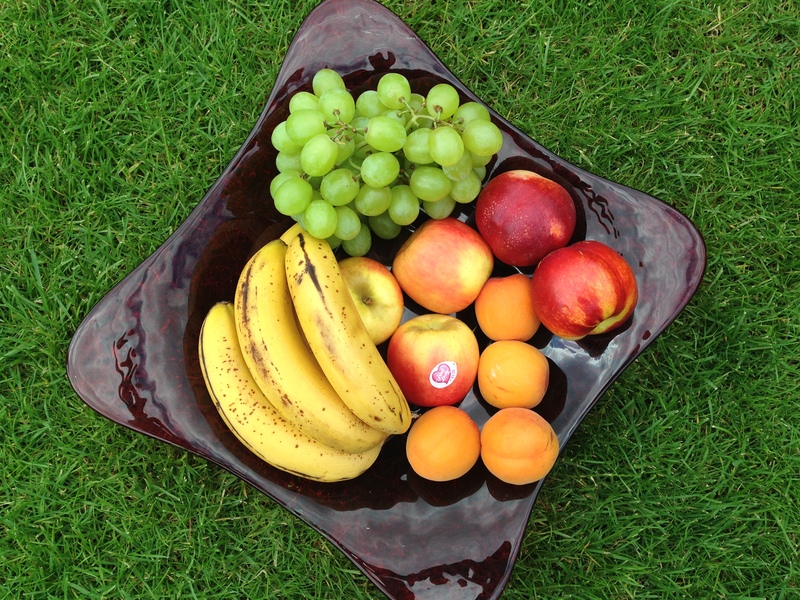 The weight of 124 grams is only marginally higher than Apple's iPhone 5c with 112 grams. The other contenders all weigh more. 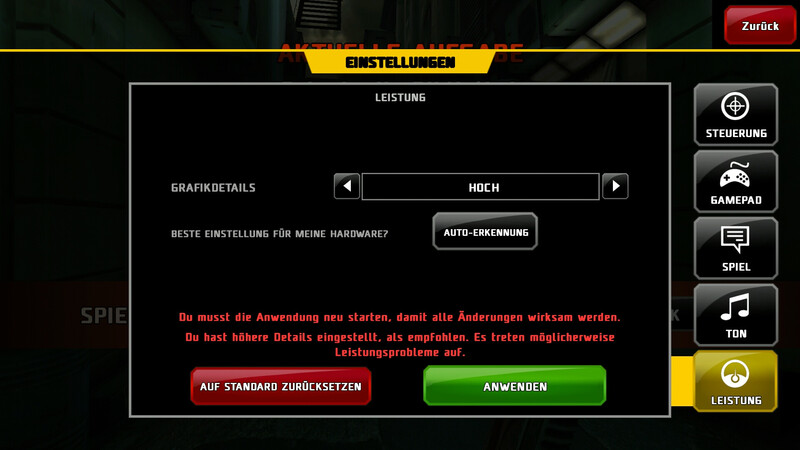 Very Apple-like: The user will not find any maintenance and upgrade options. The battery is non-removable. Huawei's Ascend P7 sports a HiSilicon Kirin 910T quad-core SoC with an integrated Mali-450 MP4 that can fall back on 2 GB of LPDDR3 working memory. The internal flash storage has a capacity of 16 GB of which approximately 12 GB is available. 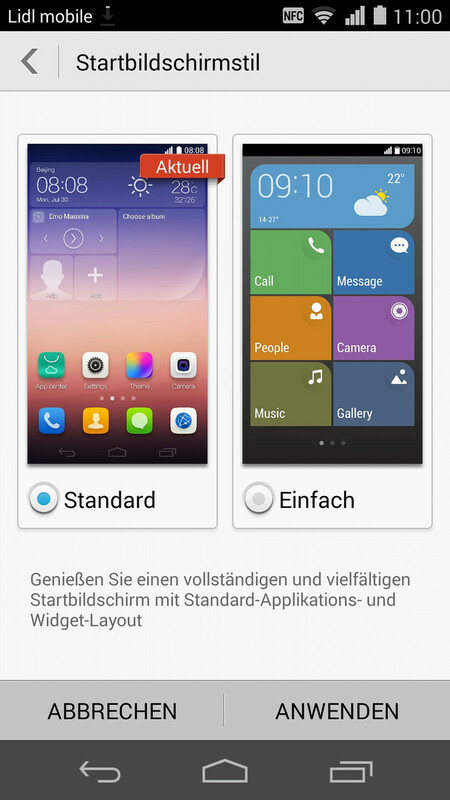 Compared with the former Ascend P6, Huawei has modified quite a bit in terms of interfaces. The loose flap of the 3.5 mm audio jack has been omitted. The port has also moved ergonomically sensibly to the upper edge. The micro-USB 2.0 port is located on the lower edge. All other ports and the physical buttons are on the phone's right side. The eject tool for the micro-SIM and micro-SD card slots is no longer incorporated. Huawei's Ascend justifies the premium claim and is delivered with the latest Android 4.42 KitKat operating system. 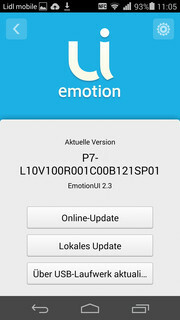 The manufacturer installs its tried EmotionUI user interface in version 2.3. 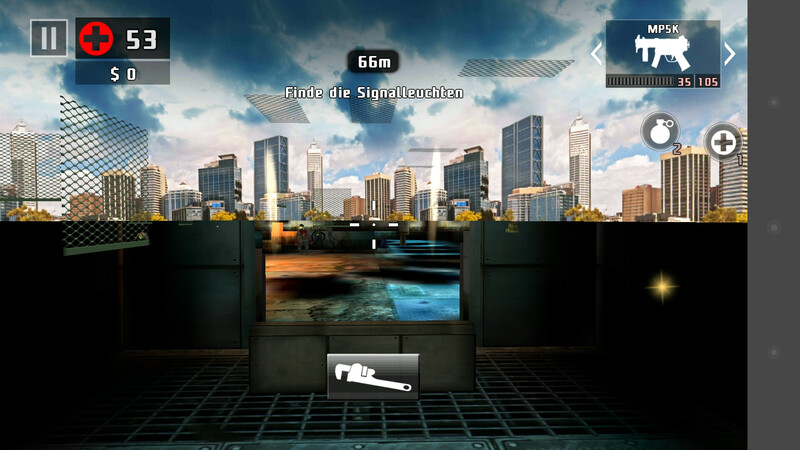 The user interface can be customized, for example, with many different color designs via the Design app. Other designs can be downloaded for free. Beyond that, all statements made about the precursor also apply to our review sample. 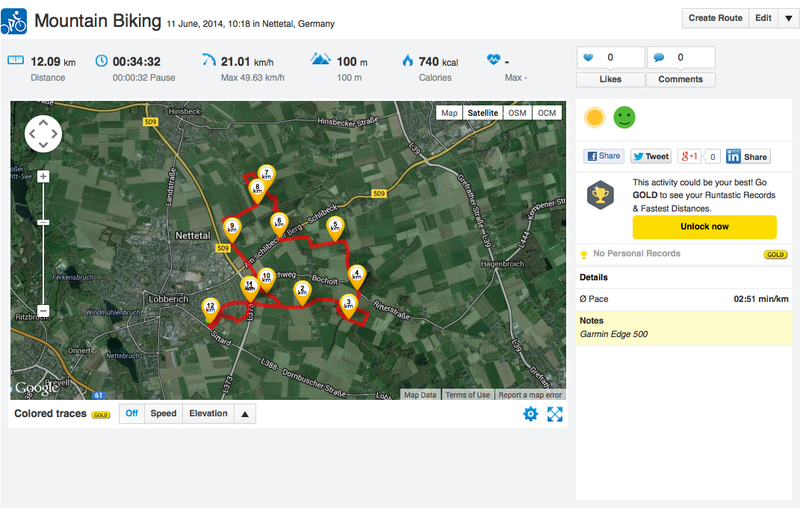 Overall, the system is very intuitive to use. Useful apps like Polaris Office 4.0, XBMC Remote and a few other productivity-boosting applications are preloaded. Huawei equips the Ascend P7 with the penta-band LTE/4G category 4 (800/900/1800/2100/2600 MHz) and a maximum data rate of 150 Mbps in download and 50 Mbps in upload. Quad-band UMTS/3G (850/900/1900/2100 MHz) with up to 42 Mbps in download and 5.76 Mbps in upload is also available. The reception was impeccable in the test. The P7 user manages local data transmission via Wi-Fi 802.11 b/g/n or Bluetooth 4.0. DLNA and NFC for connecting to compatible peripherals are also incorporated. 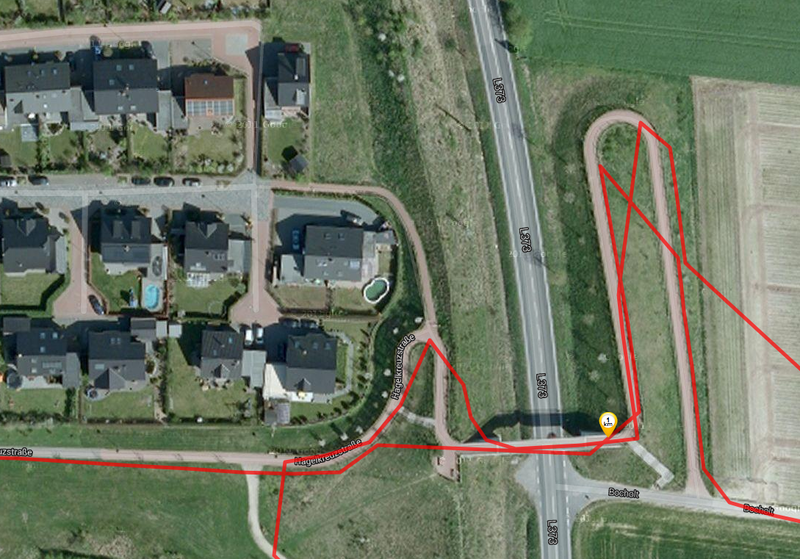 The installed A-GPS/GLONASS module also impresses with good localization, as the app GPS Test proved. 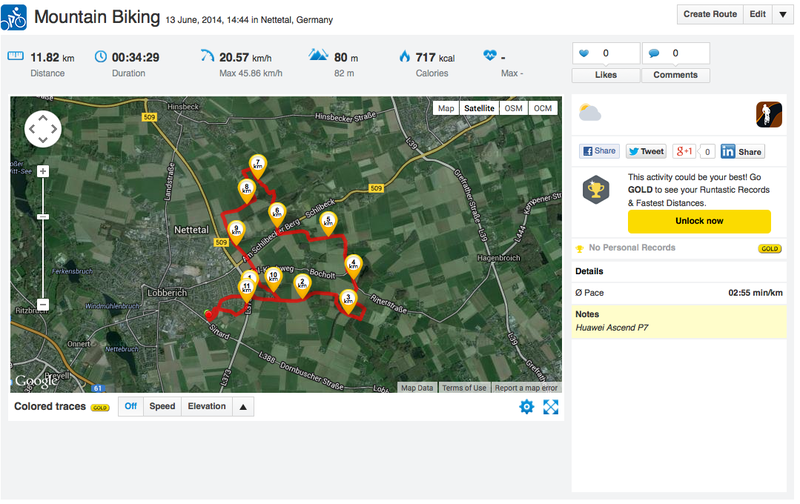 Huawei's Ascend P7 did a good job in the direct comparison with the Garmin Edge 500 navigation system in our practical test on a mountain bike. 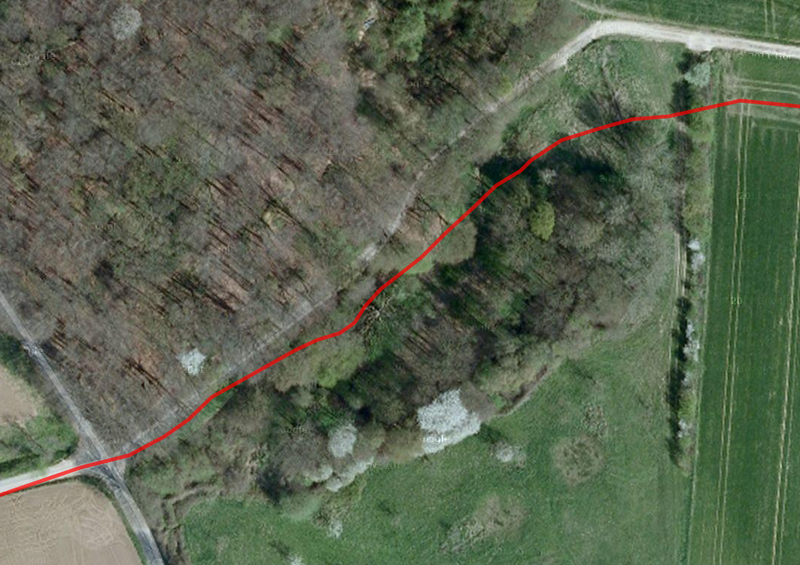 The measured route only deviated marginally, which was due to the "shortcuts" in curves. 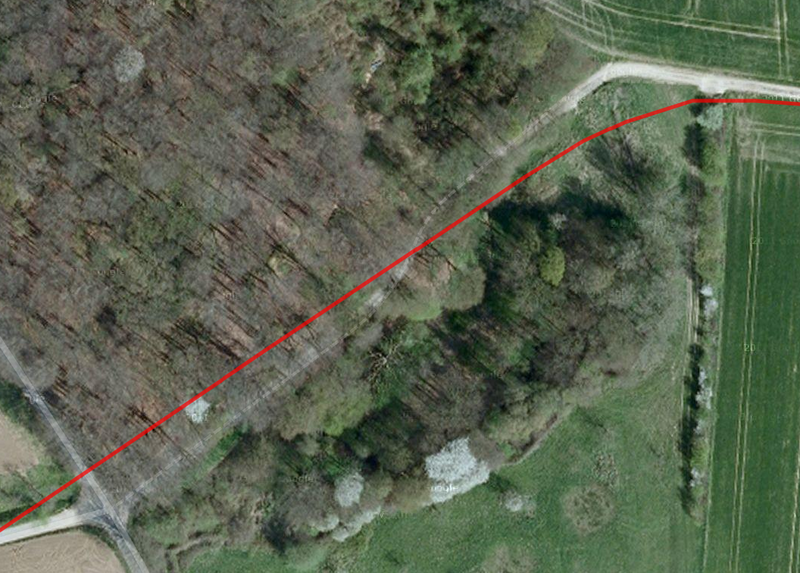 The review sample even tracked the real traveled route more accurately than the Garmin system in the woods. 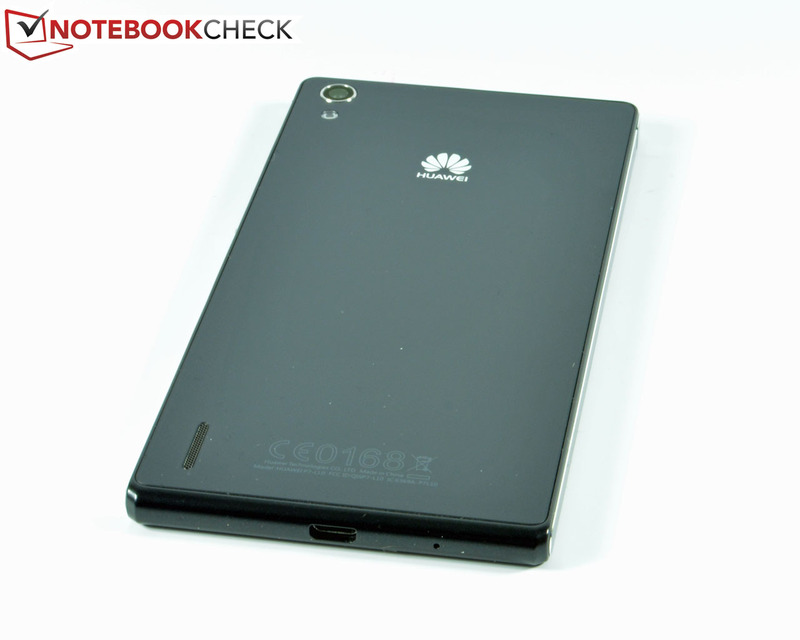 Thus, Huawei's Ascend P7 is well suitable for occasional navigating in any case. 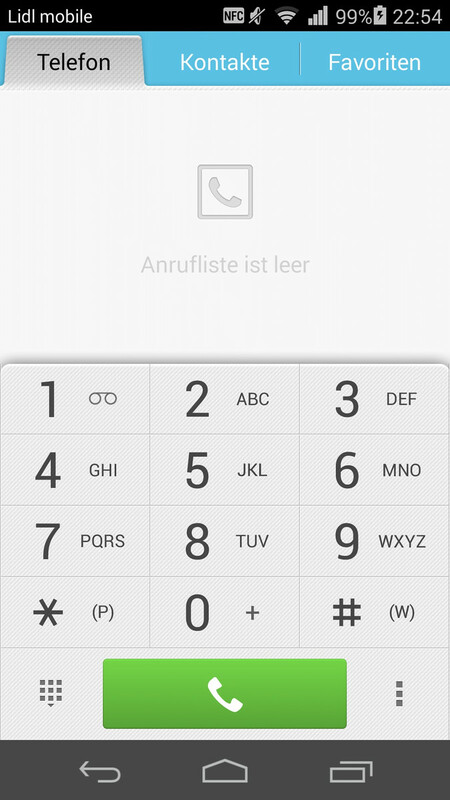 As typical for EmotionUI, the phone app is clearly arranged and intuitive and offers all important functions. 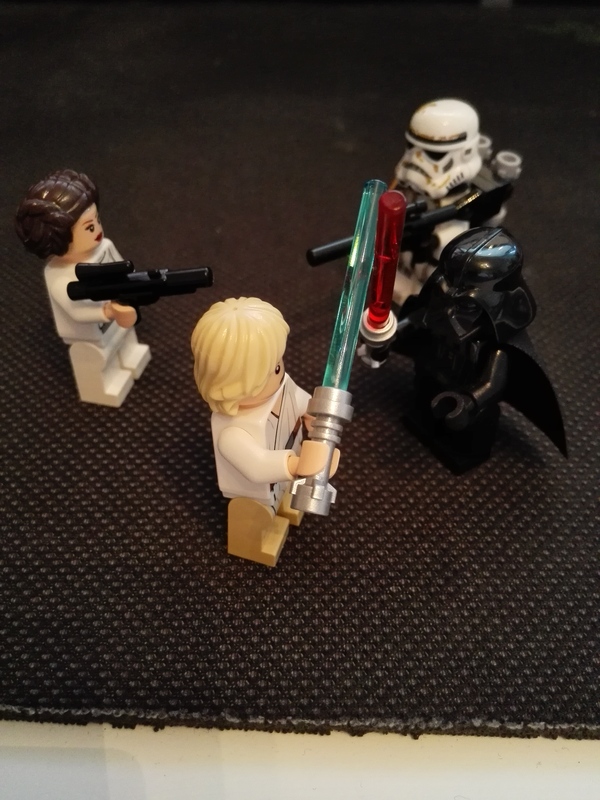 The review sample's speech and audio quality is also convincing in calls. Our contact stated a slight background noise and fairly clear intelligibility during the test call. Neither the hands-free nor making calls via the included headset gave reason for complaint. Huawei's Ascend P7 sports two camera modules. Both units record videos in 1080p with 30 fps. The rear-facing primary camera has a resolution of 13 megapixels (4128x3096 pixels) and can make use of an LED flash. The lens features auto-focus and an f2.0 aperture. The front-facing camera has a resolution of 8 megapixels, which is unique in the smartphone sector. 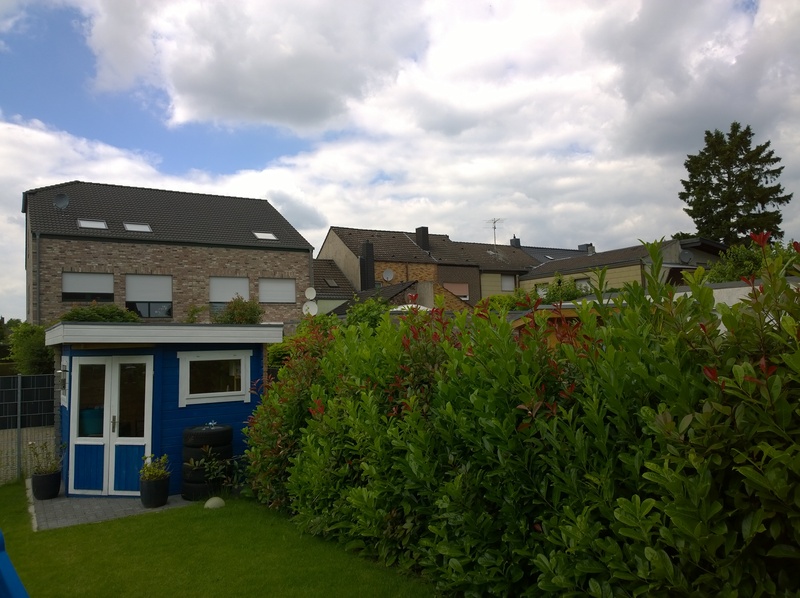 The contenders feature a maximum of 2 MP; the review sample's 8 MP is, for example, just offered by the primary camera in the iPhone 5c. 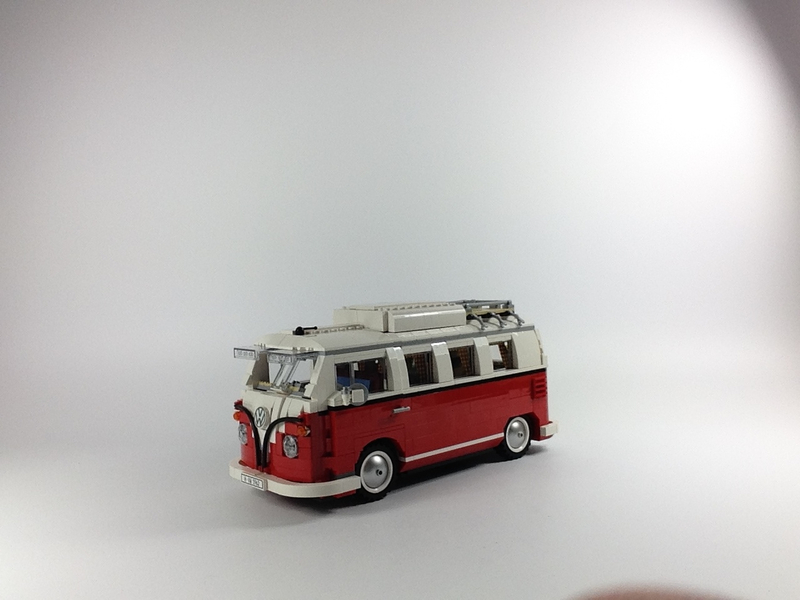 Our direct comparison with the camera in the iPhone 5 proves that not only a lot of megapixels are important. The lens size and electronic image processing are also important. 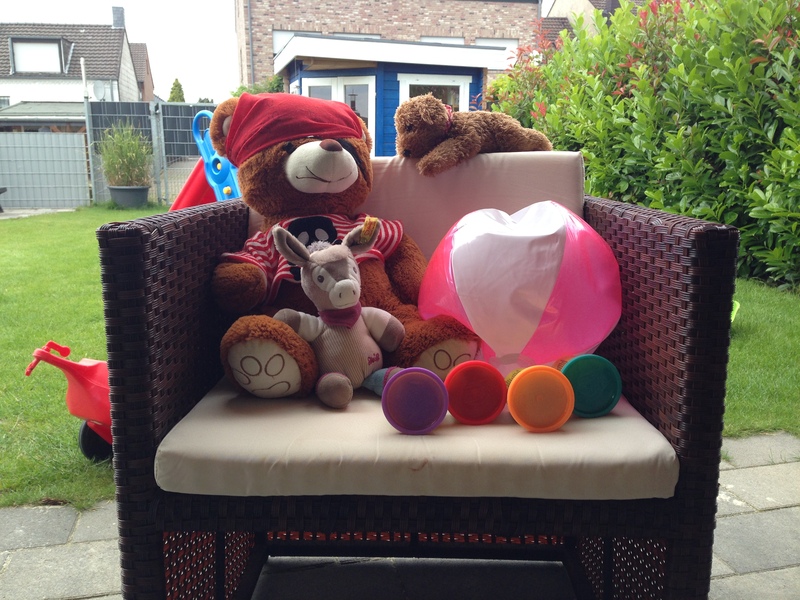 Huawei's Ascend P7 does a decent job in good light. Particularly the primary camera shoots very useful pictures that, however, exhibit a light overexposure and consequently inaccurate colors. 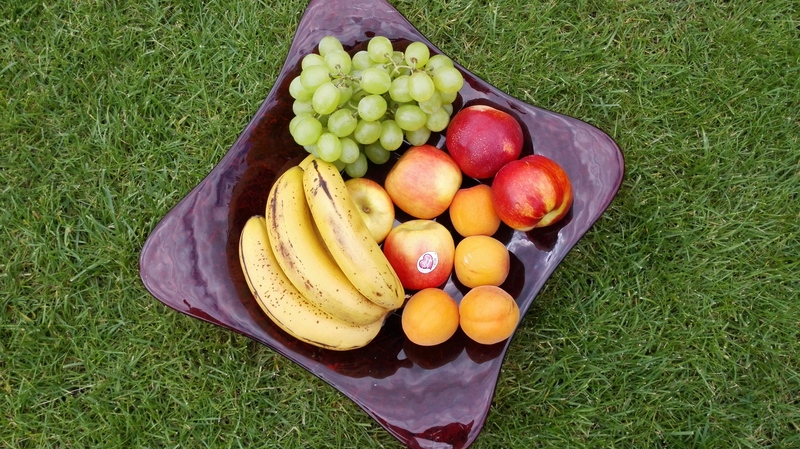 Very appealing pictures are possible outdoors and with close-ups. Although the webcam has a very high resolution, it does not capture enough light, particularly in adverse light conditions. 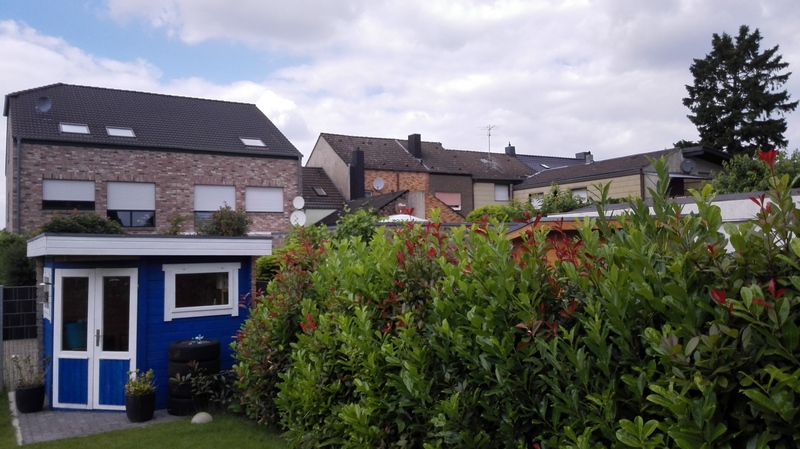 The comparison of the primary camera with the contenders and a reflex camera reveals slightly overexposed pictures with marginally untrue colors. 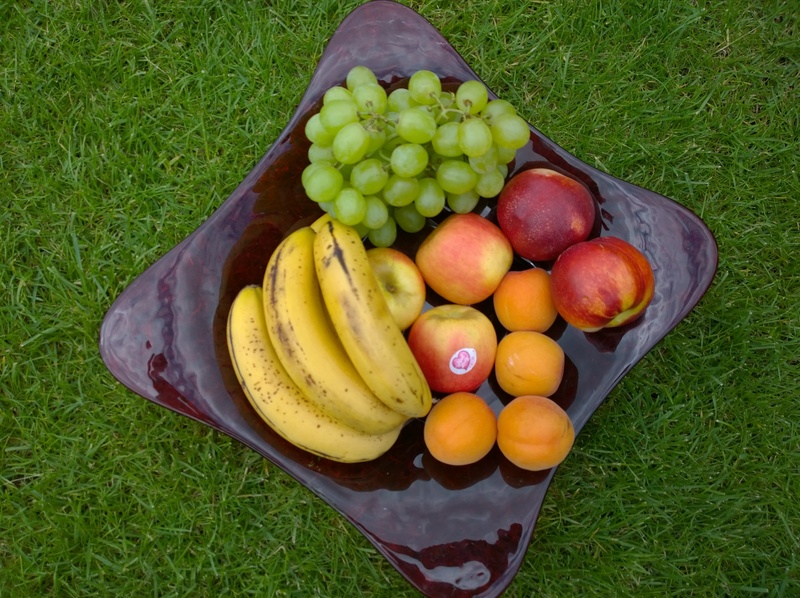 The pictures sometimes lack sharpness - particularly with objects that are a bit further away. 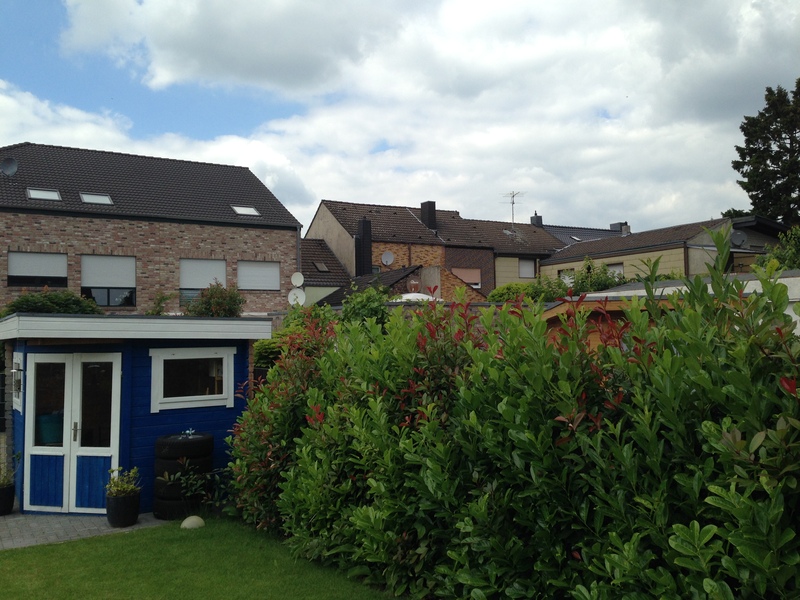 Image noise also becomes visible in difficult structures, such as the brick wall in the background of the outdoor picture. The low-light performance is also not very convincing; the small lens simply does not capture enough light. 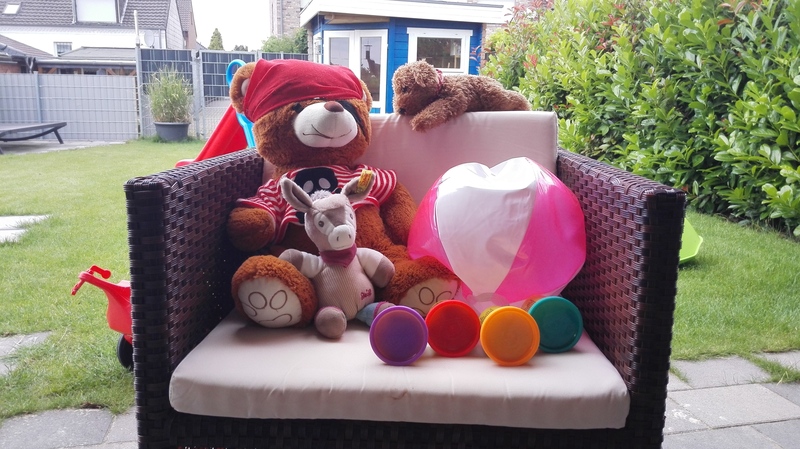 The LED flash is not of much use here either because it only brightens up close objects. Besides that, the noise increases exponentially in darker surroundings. Overall, the camera modules do a solid job. The lenses are well suitable for snapshots or selfies when not too much is expected. 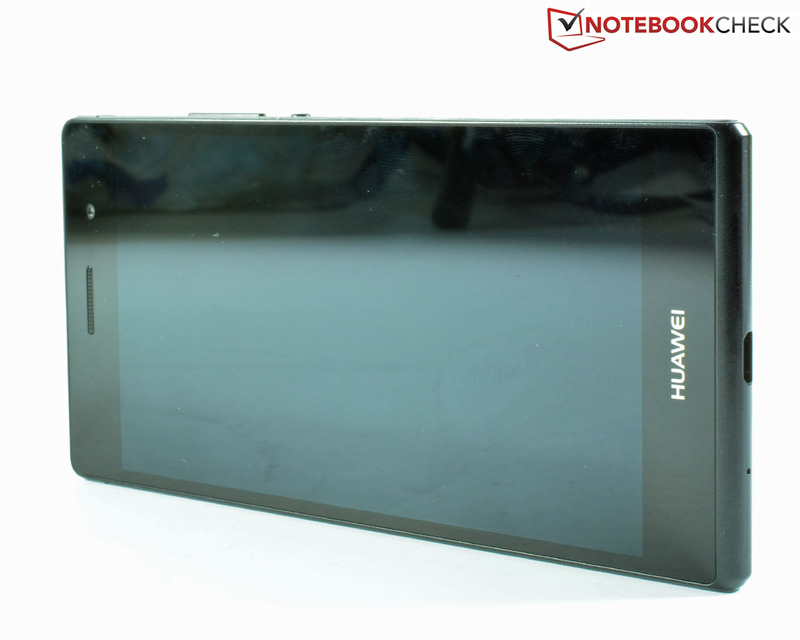 Huawei adds a modular USB power supply, a stereo headset, and a quick-start guide in the Ascend P7's stylish box - completely in white although our review sample is black. An eject tool for the micro-SIM and micro-SD slots is also included. 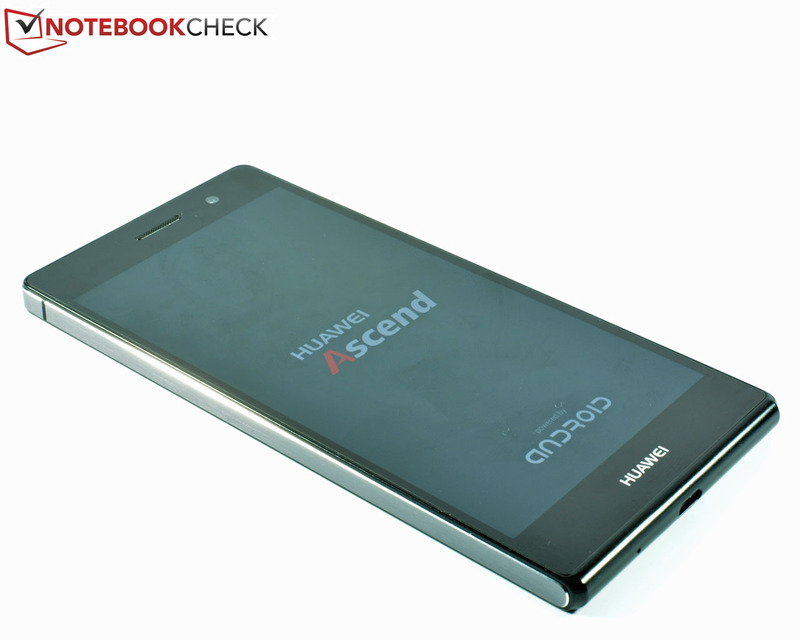 Short and sweet: Huawei includes a 24-month warranty on its Ascend P7. 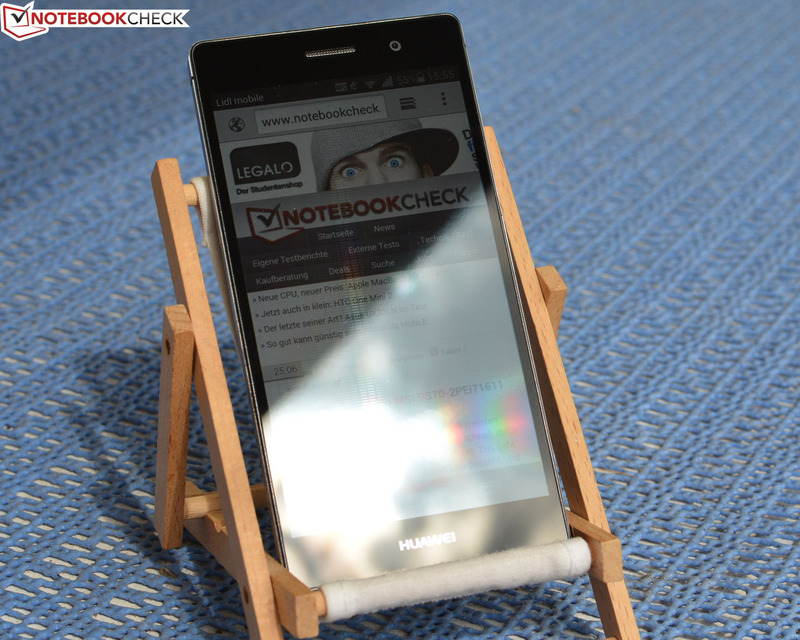 The touchscreen in Huawei's Ascend P7 is very accurate up to its edges and is easy to use. The multi-touchscreen reliably supports up to ten fingers and gesture control. The physical buttons on the casing's right feature a clear pressure point and are made of high-quality aluminum like the casing itself. 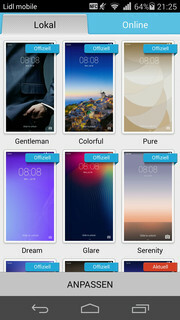 The virtual keyboard is based on the stock Android version, but Huawei has modified it. It provides the necessary keys according to the selected input field. 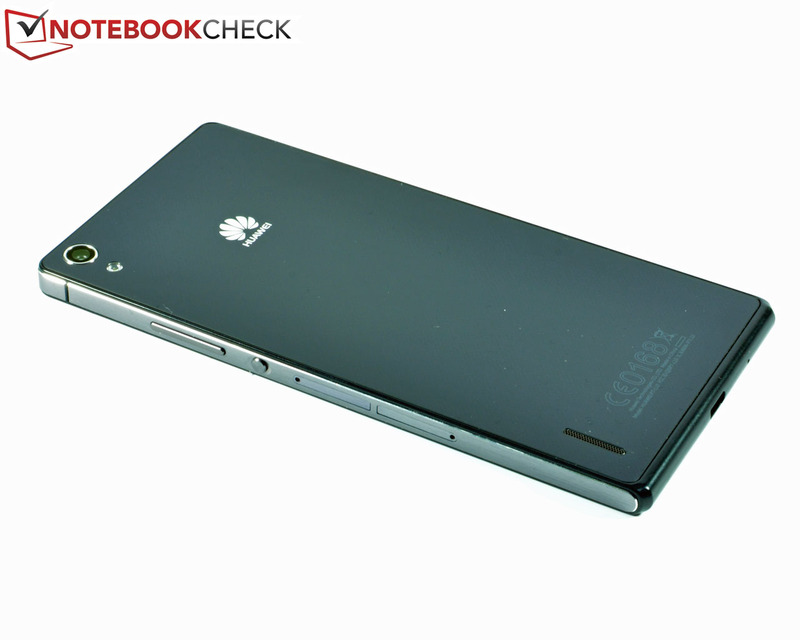 Like as known from many contenders, the Ascend P7 also features a glove mode with a higher sensitivity and gesture control. For example, muting a call as soon as the smartphone is turned over on its screen or accepting calls by holding it to the ear. 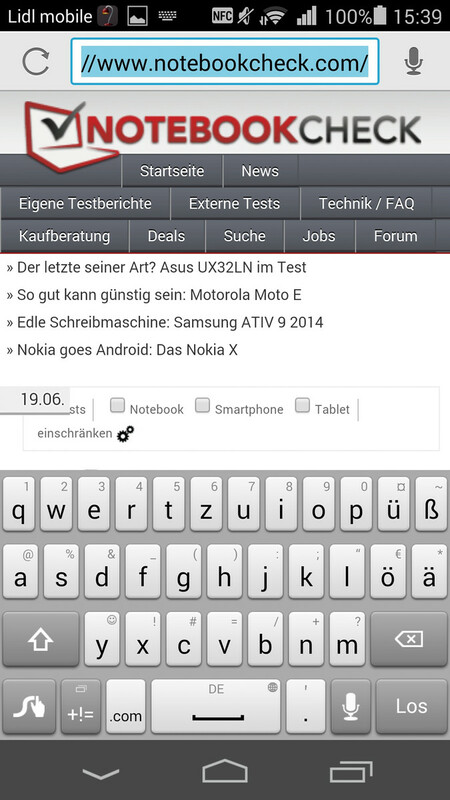 ...and landscape mode provide sufficiently sized keys. 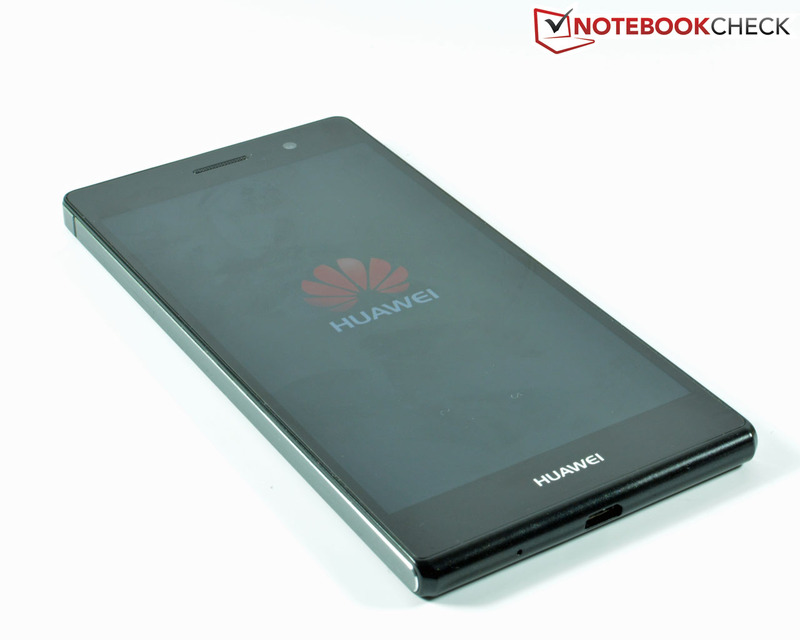 Huawei took the criticism placed on the former Ascend P6 and its low resolution to heart and equips the Ascend P7 with a larger 5-inch screen with a Full HD resolution of 1920x1080 pixels. Thus, Huawei's flagship is now on par with contenders like Google's Nexus 5 and Samsung's Galaxy S4 or S5. Huawei's Ascend P7 does not have to shy from comparison with the contenders in brightness either. We ascertained an average of 469.6 cd/m² in conjunction with a very homogeneous illumination of a high 92%. 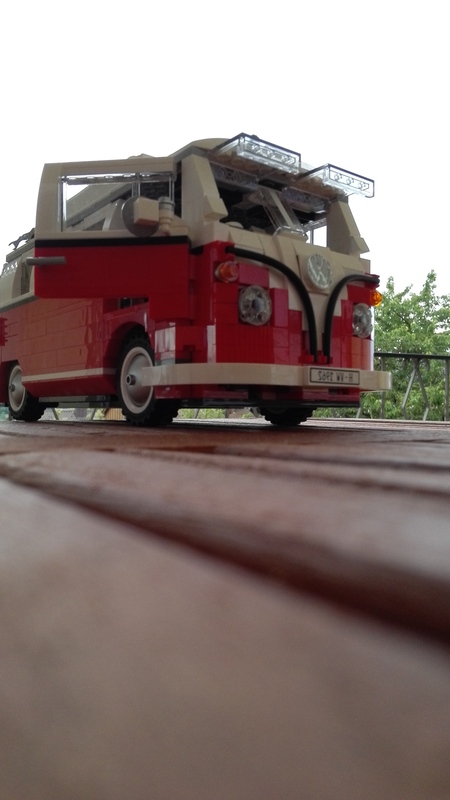 It achieved a maximum of 489 cd/m². 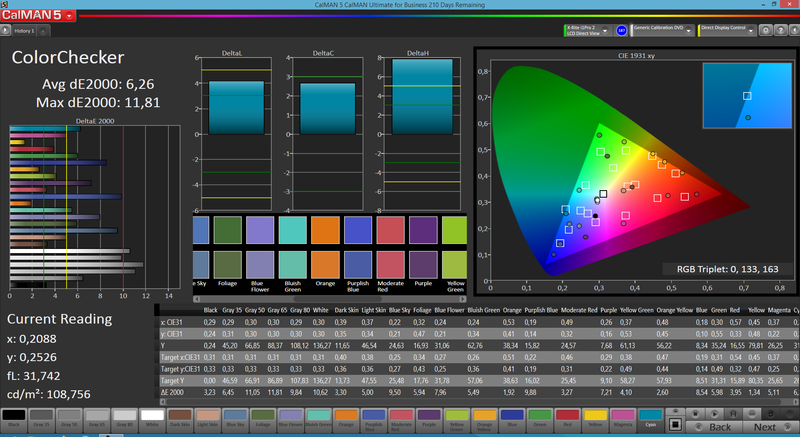 The Ascend P6 precursor was a bit brighter with 486.8 cd/m². Although the iPhone 5c outshines all rivals with 537.2 cd/m², its illumination of 87% is poorer. The other phones in the comparison field have to take place at the back. 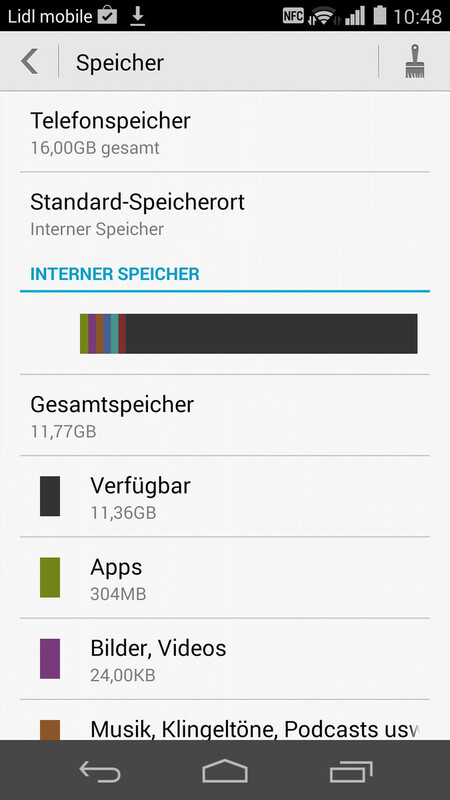 Google's Nexus 5 is still closest with 451.7 cd/m², but it has a marginally better illumination. 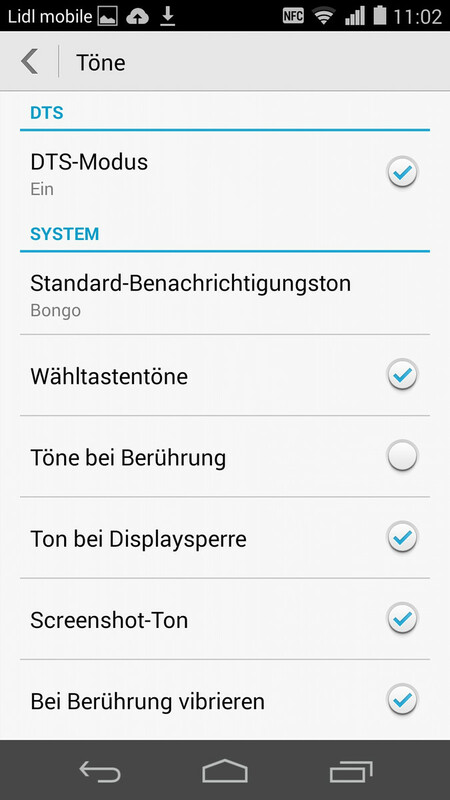 LG's G2 is not as bright with 330.1 cd/m² and illumination of 84%. The OLED contenders in form of BlackBerry's Z30 with 277.9 cd/m² and 91%, and Samsung's Galaxy S4 with 300.6 cd/m² / 95% are clearly outperformed. 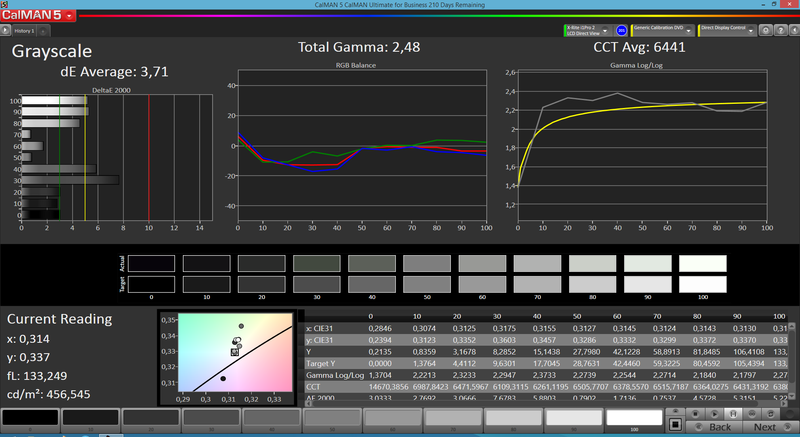 However, our review sample cannot at all keep up with its black level of 0.92 cd/m² and a contrast of 504:1. The iPhone 5c (0.66 cd/m²/ 867:1), Google Nexus 5 (0.49 cd/m² / 957:1) and LG G2 (0.33 cd/m² / 1085:1) rivals offer more in this field. The OLED-based Samsung Galaxy S4 and BlackBerry Z30 are unfair contenders owing to their perfect rates. 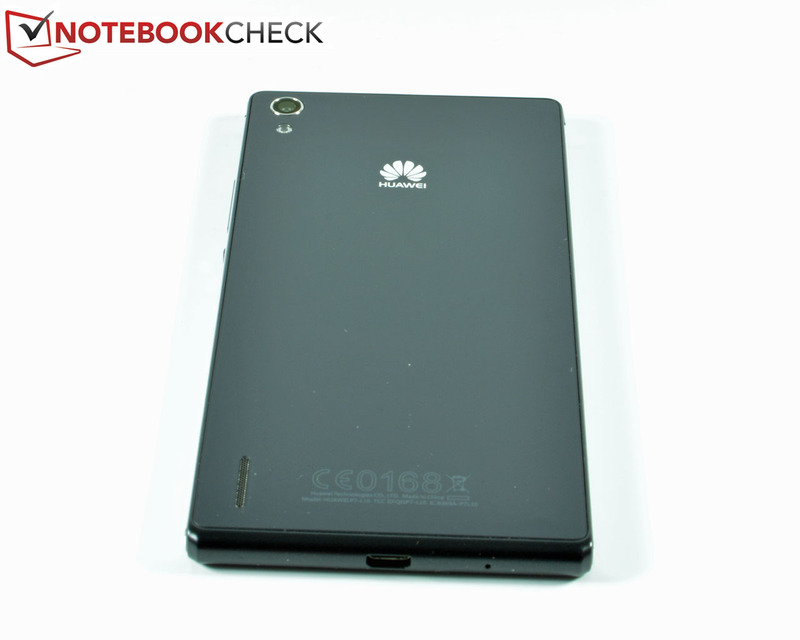 Even the former Huawei Ascend P6 achieved better rates with 0.58 cd/m² and 860:1. Nevertheless, there is not much reason for complaint subjectively because black areas look vivid, and colors look saturated. Like in the precursor, the user can manually adjust the color temperature in three levels (cold, default, warm). 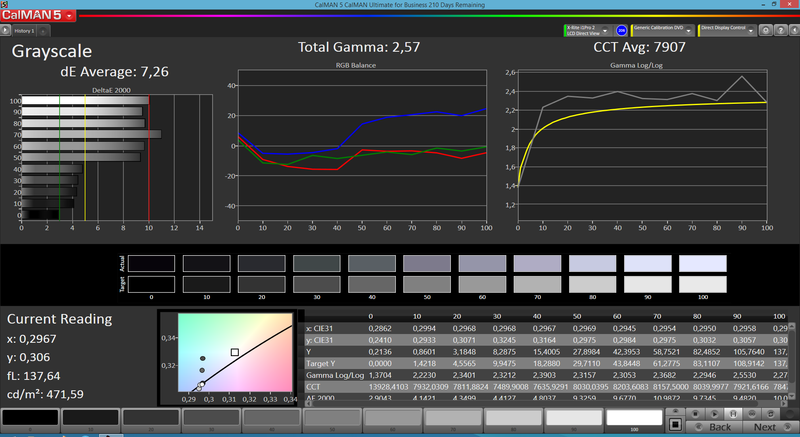 Our tests using the colorimeter and CalMAN confirm rates close to the reference color space in the setting "warm" (set to approximately 20%). The color temperature here is 6441 k, which is very close to the reference of approx. 6500 k. Apart from that, the Gamma of 2.48 is very good, just like the average DeltaE of 4.18 in mixed colors. That is a considerably higher 6.26 in the default settings. The grayscale reproduction is also very appealing in the 20%-warm setting and presents a low DeltaE of 3.71. Nevertheless, a slight greenish/yellowish cast is visible here. 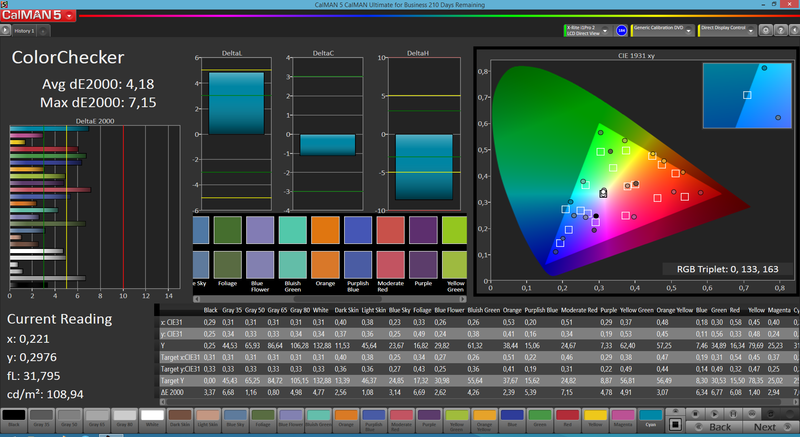 Among the compared devices, only Samsung's Galaxy S4 and S5 feature an even more powerful color setting editor. 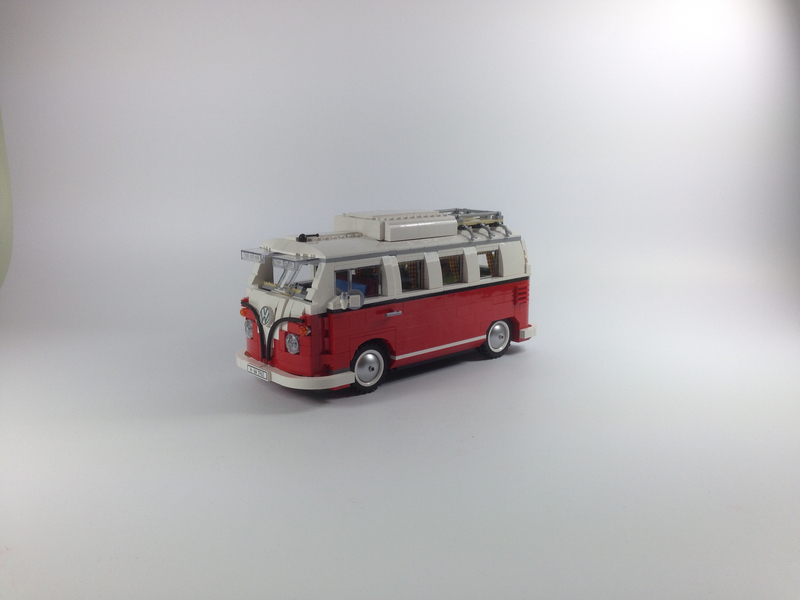 Subjectively, our review sample does a very good job with the color reproduction. 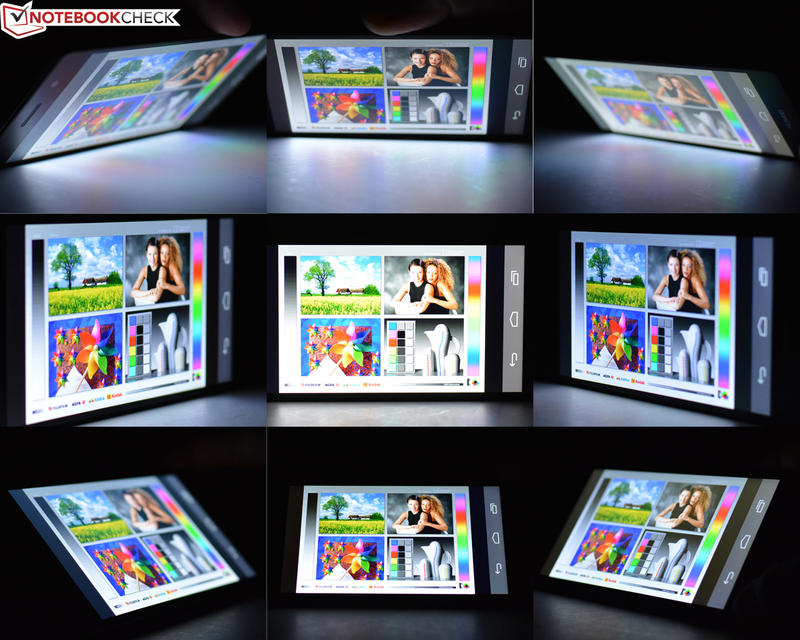 Owing to the high brightness, displayed content could still be recognized well even outdoors. Although the very glossy screen cannot defy direct sunlight, it was still possible to recognize something. No problems were noticed in half-shade. The automatic brightness control also always functioned reliably. The screen is based on the IPS technology that offers a very stable color reproduction even in extreme viewing angles. Only the brightness drops marginally in narrow viewing angles. ...but content is easy to recognize in half-shade. Huawei installs a quad-core SoC in the form of HiSilicon's Kirin 910T, which is virtually its own product because HiSilicon Technologies belongs to Huawei. The brand new CPU clocks with 1.8 GHz. The smartphone presented a mixed performance in our benchmark course. In contrast to AndEBench and AnTuTu v4 where Samsung's Galaxy S4 and Galaxy S5 only achieved a slight lead, Geekbench 3 was more drastic. 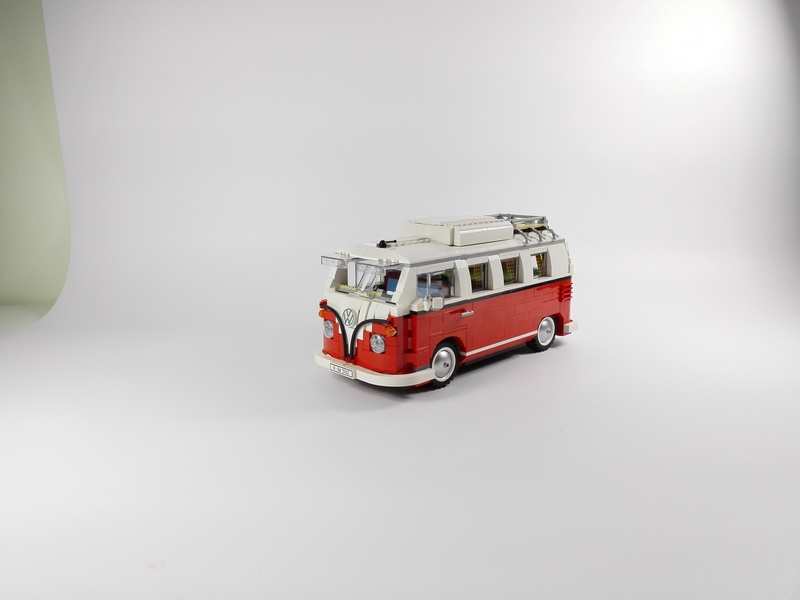 Although the review sample could outperform Google's Nexus 5 in the single-core test with its high base clock, it had to let the other contenders pass. It could still surpass the BlackBerry Z30 and Apple iPhone 5c in the multi-core test, but all contenders left the Ascend P7 far behind in Linpack, thus showing where the new SoC should be seen. It looks similar in PassMark Performance Test. Huawei's Ascend P7 managed a slight lead over its contenders, with the exception of Apple's iPhone 5c, only in the 3D Graphics test. 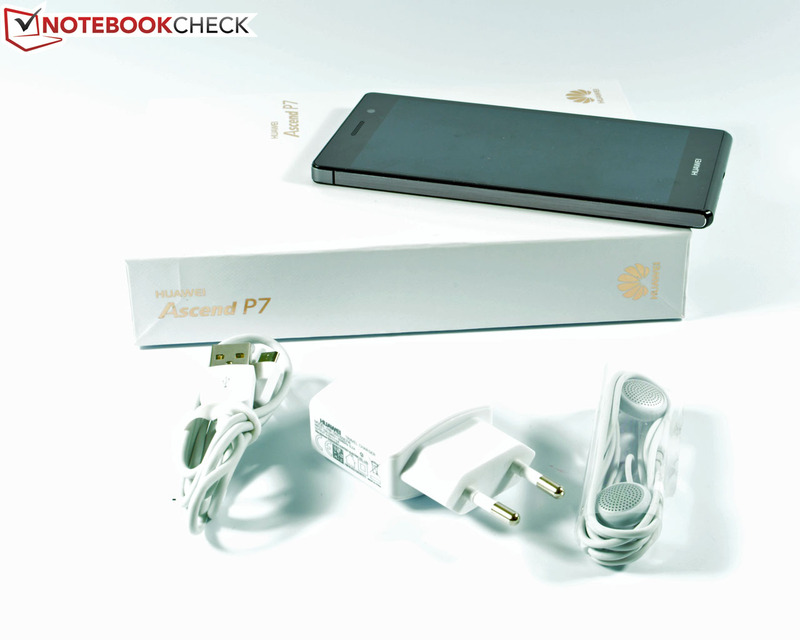 Consequently, the Ascend P7 is more in the upper mid-range in terms of performance. However, this shortcoming is not noticed in routine use. Navigating through the operating system is fast and reliable. 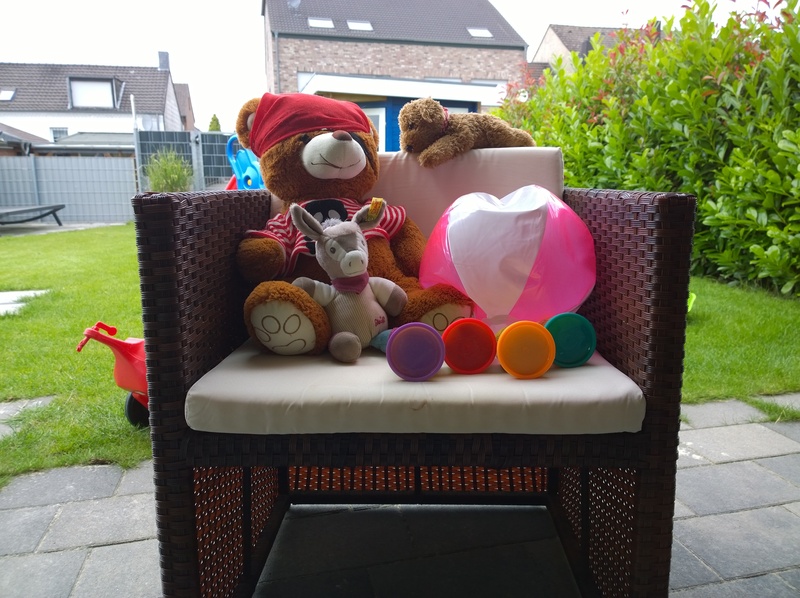 The synthetic 3D graphics benchmarks turn out similar. It was usually only Apple's iPhone 5 that calculated slower in the 3DMark tests. Our review sample first did a better job in the Full HD test Ice Storm Extreme. All in all, it was also only middling in the comparison. The contenders also mostly manage the browser benchmarks more effectively. Although BlackBerry's Z30 operates consistently slower, our review sample often scored worse than LG's G2 or Google's Nexus 5. In the more real-life WebXPRT 2013 benchmark, the P7 gained ground considerably, and it could surpass almost all rivals, including Samsung's Galaxy S5 in some tests. This is noticed in a quite swift page setup and decent performance in routine browsing. That would feel even faster when using swifter browsers, such as Google Chrome. The SoC integrated ARM Mali-450 MP4 graphics card supports OpenGL ES 2.0 and almost achieves the performance of a Qualcomm Adreno 320. Since the graphics chip does not support OpenGL ES 3.0 yet, it cannot perform current benchmarks like GFXBench 3.0 Manhattan. 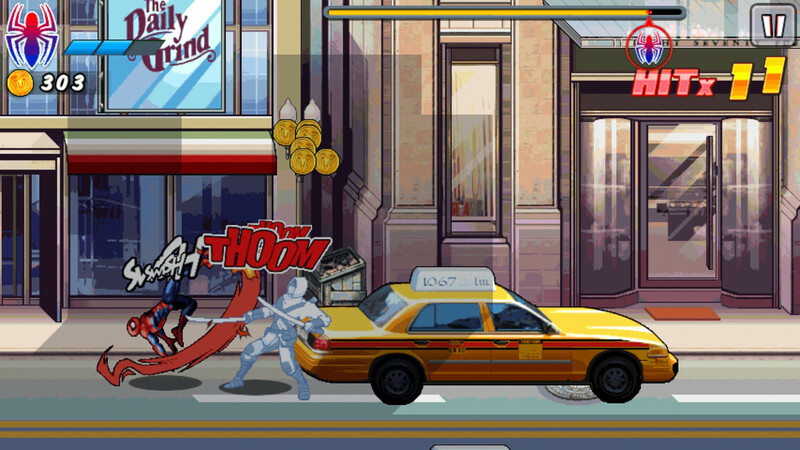 Nevertheless, the available performance is sufficient for smoothly rendering up-to-date Android games. We tested the performance based on a few titles. 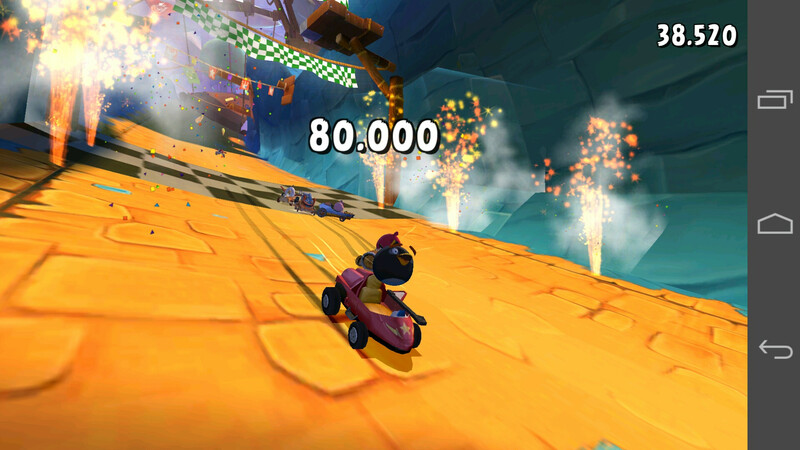 While the kart-racing game Angry Birds Go! 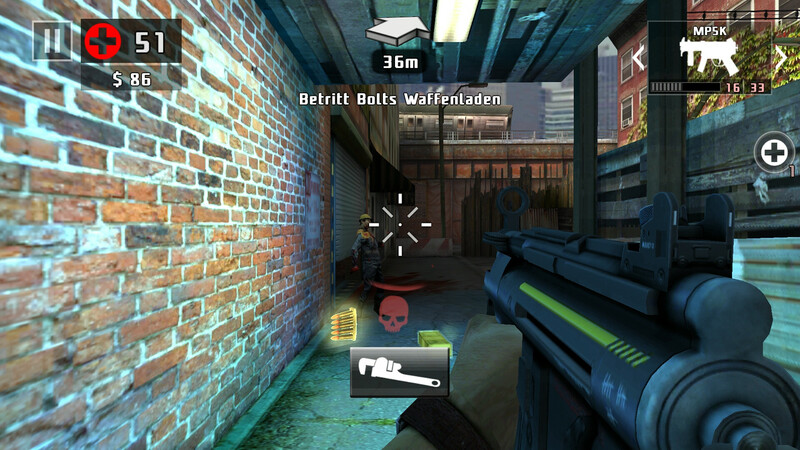 ran smoothly, problems turned up in the first-person shooter Dead Trigger 2. 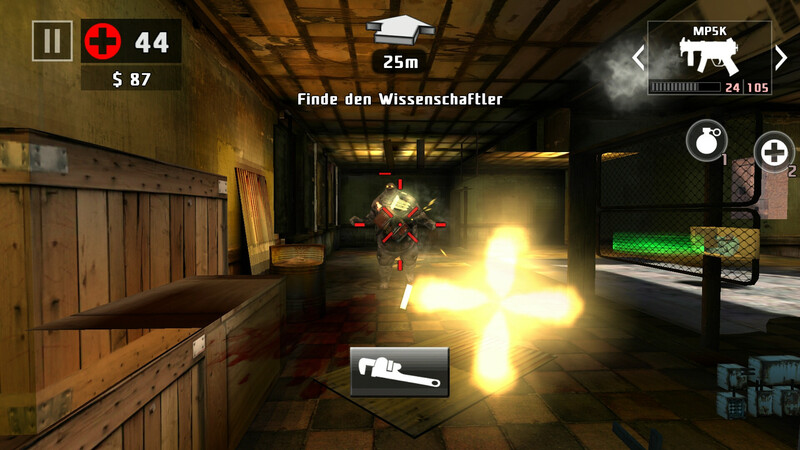 The zombie chase ran lag-free in low detail settings, but graphics errors repeatedly occurred in high settings. The game, however, already warns about this possibility in the menu. 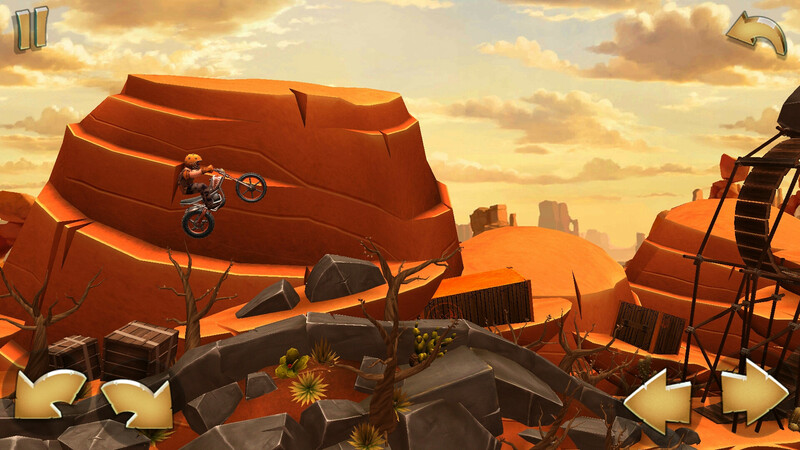 Other current titles, such as Spiderman Ultimate Power or Trials Frontier, ran without problems. The large touchscreen considerably contributes to the gaming fun because it responds accurately and fast. Both the accelerometer and position sensor also function impeccably and accurately. 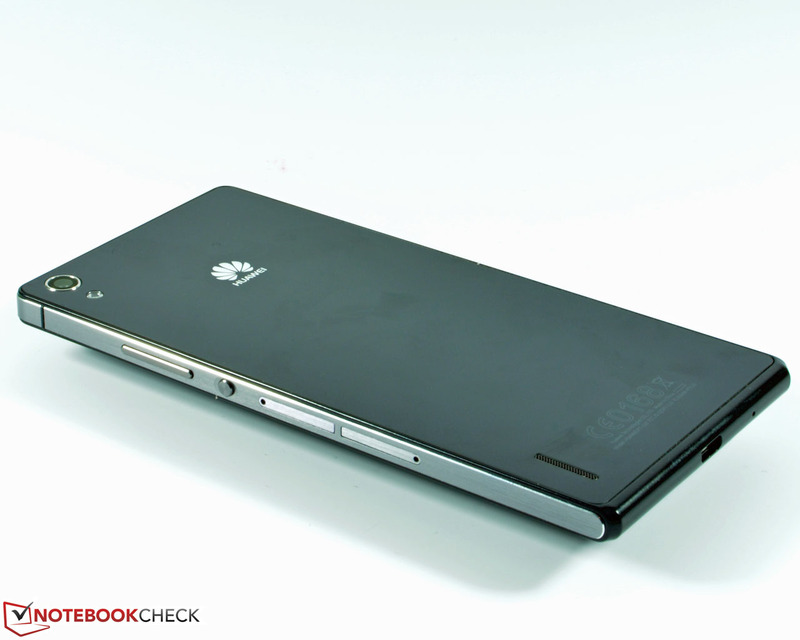 Huawei's Ascend P7 does an even better job than its precursor in this section, although it sports stronger components. The somewhat larger casing and the consequently better heat dissipation is likely noticed here. 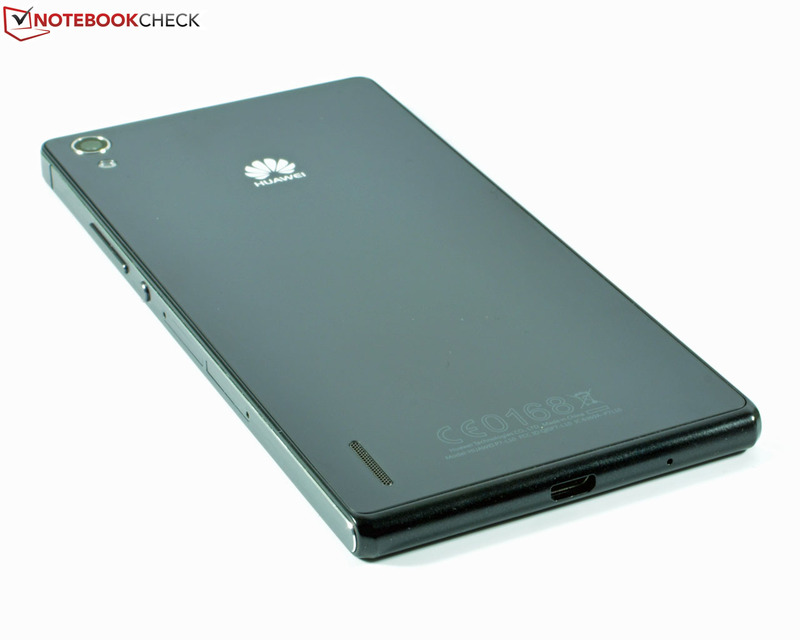 We ascertained a maximum of 37.9 °C during full load, which is approximately 4 °C less than in Huawei's Ascend P6. The average was only 32 to 35 °C. The review sample is also respectably on par with its rivals used for comparison and is much cooler than Samsung's Galaxy S4 or Galaxy S5. The surface temperatures dropped over a large area to below 30 °C in idle mode. The phone reached a maximum of 33.8 °C in some places. Overall, Huawei's Ascend P7 always stays pleasantly cool, and it only gets a bit warmer in some spots and in permanent full load. (+) The maximum temperature on the upper side is 37.9 °C / 100 F, compared to the average of 35.5 °C / 96 F, ranging from 22.4 to 51.7 °C for the class Smartphone. (+) In idle usage, the average temperature for the upper side is 30.4 °C / 87 F, compared to the device average of 33 °C / 91 F.
The little mono speaker is on the smartphone's back and pleases with a high maximum volume and few distortions. However, this speaker is also affected by a lack of bass and restrained mids. 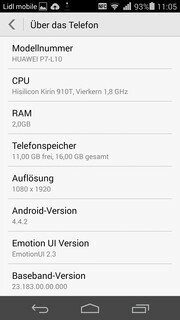 Nevertheless, Huawei's Ascend P7 does quite a good job in the category comparison and additionally scores with optional Dolby Digital Plus settings. The 3.5 mm audio jack convinces with little background noise and a high volume. 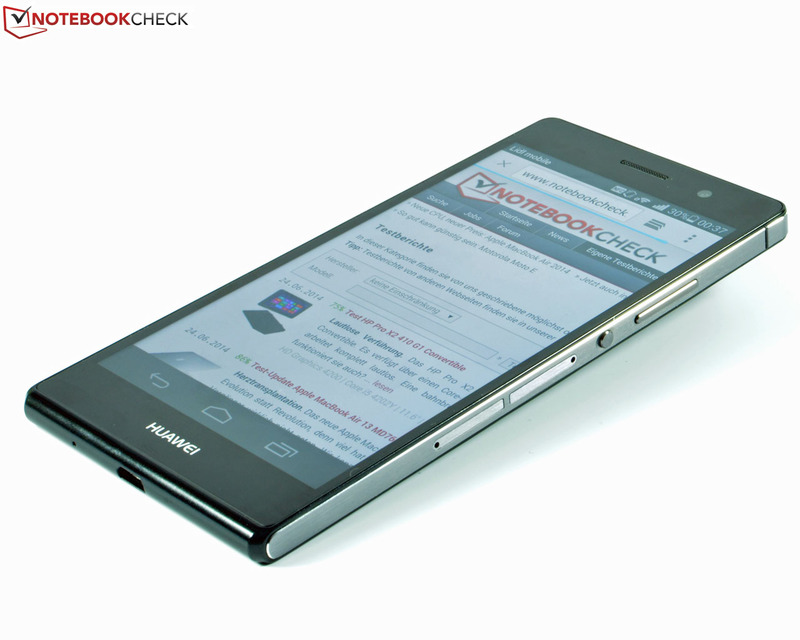 Although the screen and performance have grown, Huawei's Ascend P7 consumes considerably less power than its precursor. In figures, that would be 0.6 to 2.0 watts when idling. However, contenders like the frugal BlackBerry Z30 or Google Nexus 5 show the way. Our ammeter recorded between 3.9 and 5.2 watts under heavy load - which is still clearly below the rates of the Ascend P6 but also on par with rivals like Samsung's Galaxy S4. The standby consumption of 0.1 watts is also finally up-to-date. The low power consumption in conjunction with the now larger 9.5 Wh / 2500 mAh battery should let Huawei's Ascend P7 clearly surpass its precursor in battery runtime. The review sample impressively confirms this theory with approximately 30% longer runtimes. 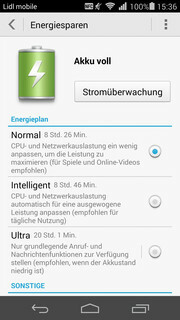 The P7's maximum runtime is 16 hours and 3 minutes in the energy-saving mode using minimum brightness. 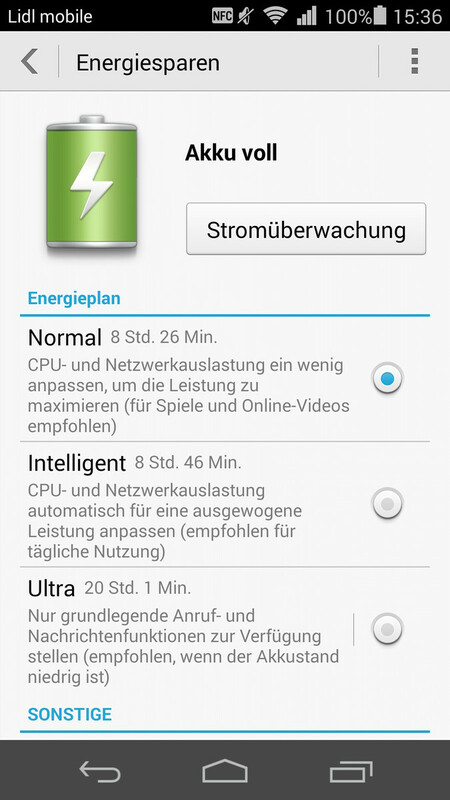 The smartphone shuts down after 3:48 hours in the load test with maximum brightness. 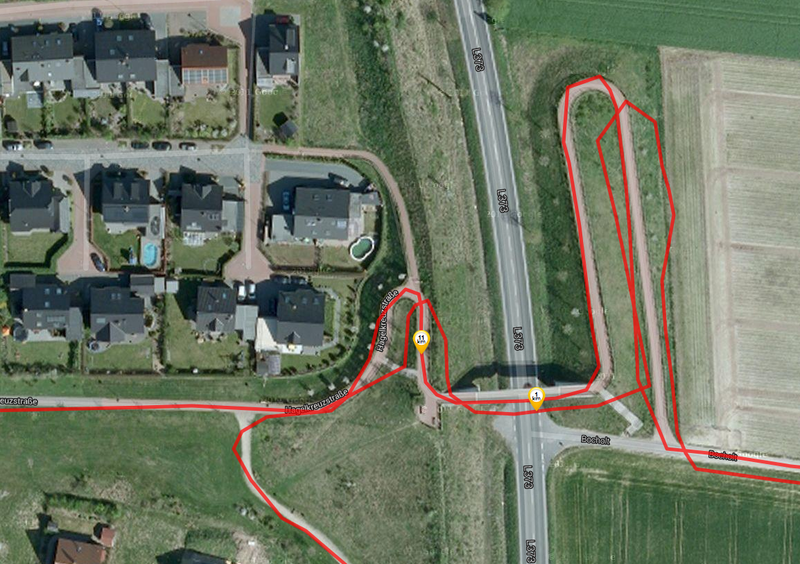 Our Wi-Fi test performed using a brightness set to 150 cd/m² (approx. 70%) and a medley of websites is more realistic. It finished after a good 9:34 hours. This good impression is put back into perspective when compared with the contenders. They all last longer - endurance devices like BlackBerry's Z30 even last almost twice as long. The review sample only proved to be absolutely competitive in the full load test. The bottom line is that Huawei's P7 is completely suitable for everyday use, and it even lasts a day away from an external power source. 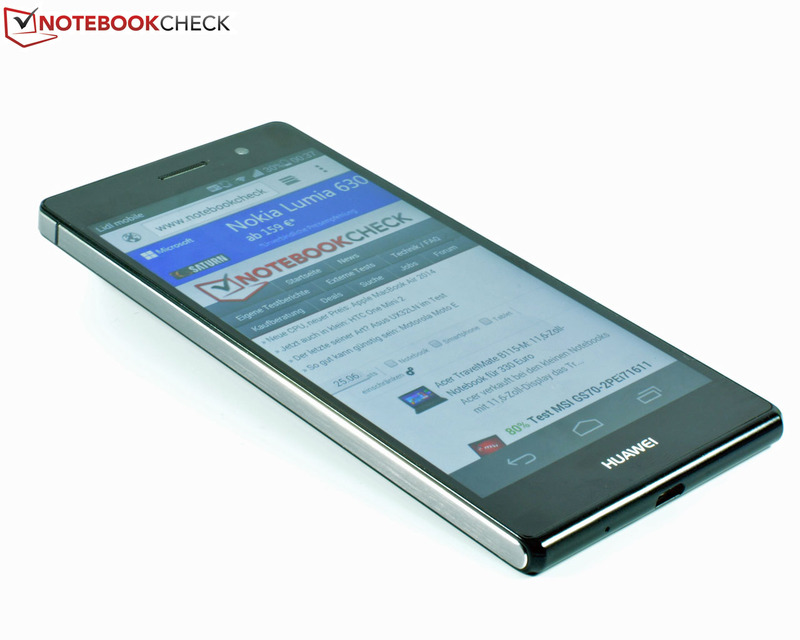 In review: Huawei Ascend P7, courtesy of Huawei. 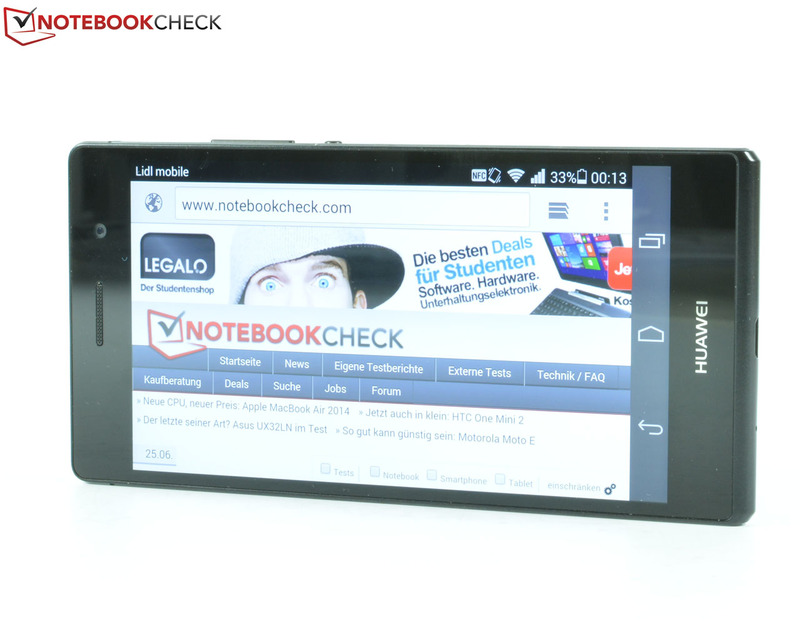 Huawei does not penetrate the top-of-the-line smartphone sector with its Ascend P7. It simply lacks the first rate components, such as a competitively swift SoC with a high-performance graphics chip. 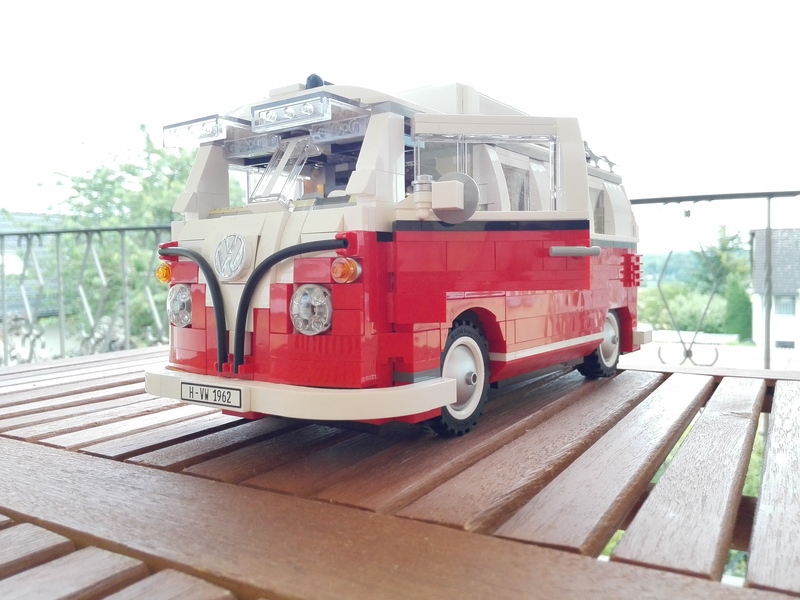 The elegant, timeless design and the excellent build would throughout be competitive in this sector though. Its intuitive use alongside the generous included software, the good speech quality, and the wireless modules' consistently good reception convinced us - keyword: LTE. 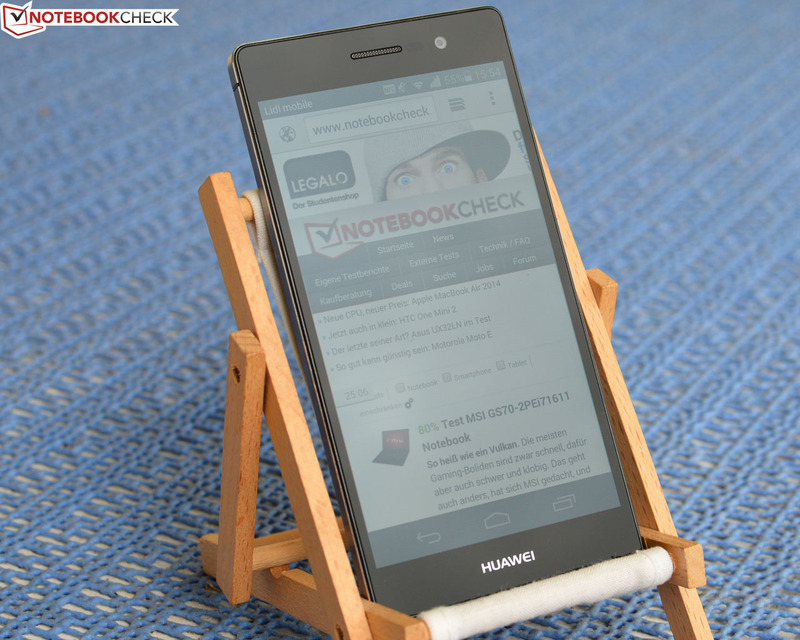 The Ascend P7 also reaps in points with its bright, viewing angle, and high-resolution IPS Full HD screen. 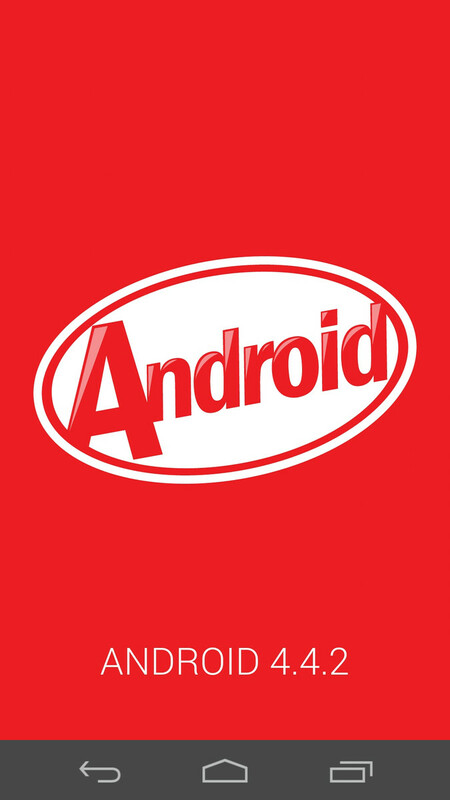 Furthermore, the latest Android 4.42 KitKat, a large flash storage that can also be expanded via a micro-SD card and all relevant interfaces are also on board. 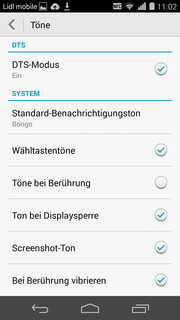 Even more so with NFC and DLNA. The always pleasant surface temperatures are also positive, and the battery runtimes are just as solid, though they could be longer especially in the comparison. However, with an RRP of around 450 Euros (~$601), the smartphone is not as pricey as most contenders. Cuts have then been made in the SoC that is strong enough for most everyday situations, but that seems a bit sluggish for a flagship and cannot reach the premium sector. 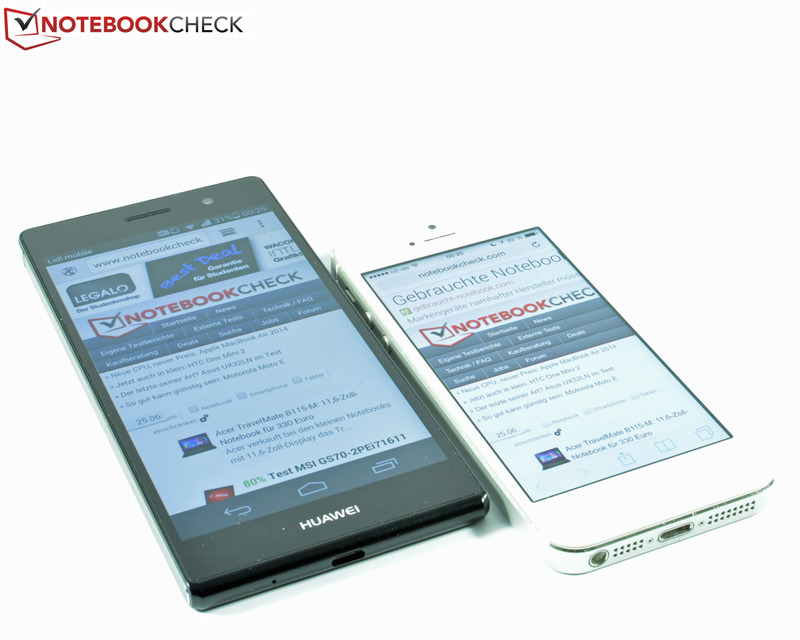 Since the device cheated in different benchmarks, we had to lower its performance rating. 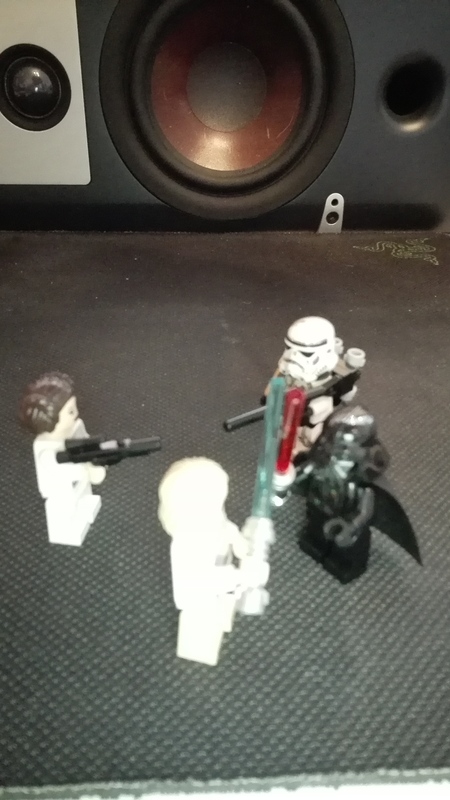 The camera modules do not provide top notch performance, and the small speaker that does not actually do a bad job but does not present an exceptional performance either. 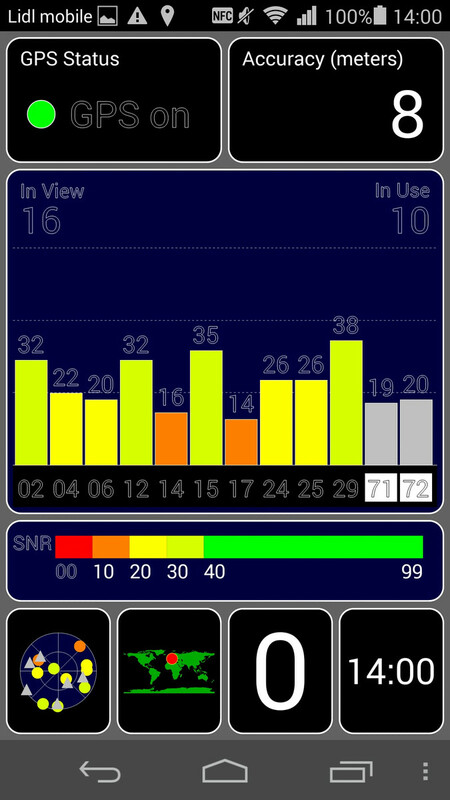 It is too bad that although the Wi-Fi module always functions reliably, it does not provide the really high-speed ac standard. 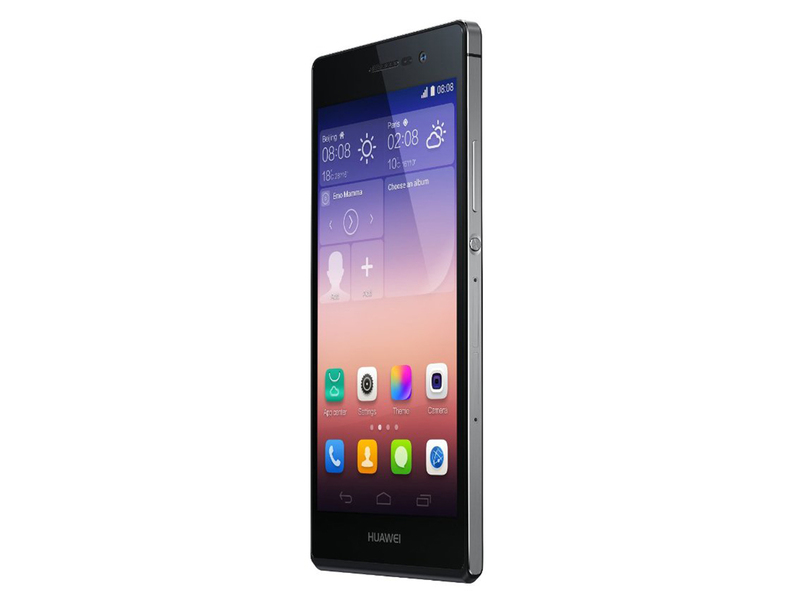 So users who do not need absolute top performance in every sector and are satisfied with the upper mid-range will find a great total bundle for a fair price in Huawei's Ascend P7. Google's Nexus 5 is a very strong rival in this price range though. 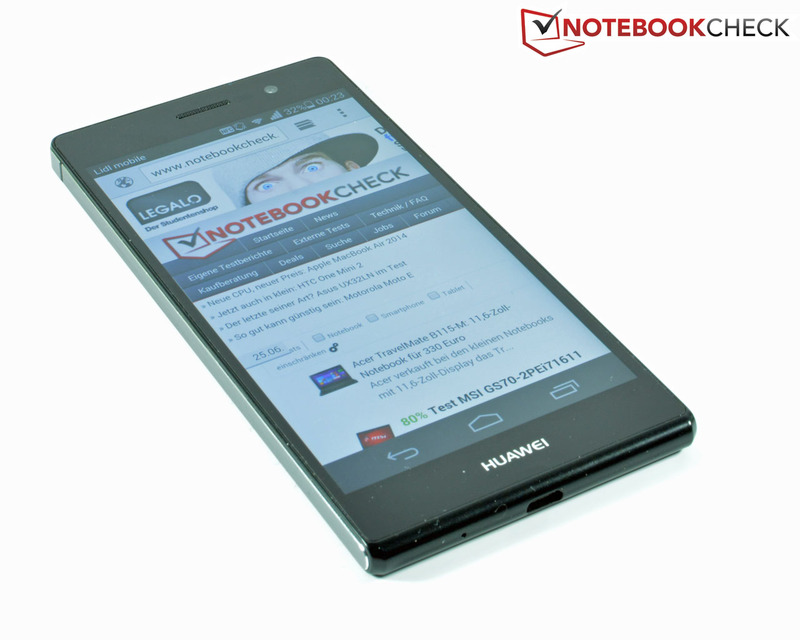 In review: Huawei Ascend P7. Test sample courtesy of Huawei. Huawei's Ascend wants to penetrate the top-of-the-line smartphone sector. ...the design is elegant and timeless. 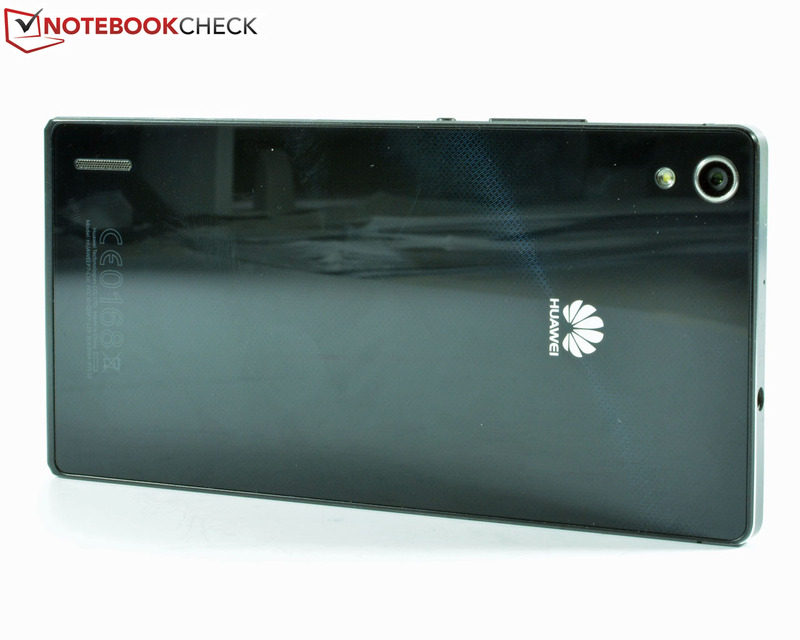 The accessories of Huawei's Ascend P7 are always white, although our review sample is black. ...opening the micro-SIM and micro-SD card slots. The P7 offers a net storage capacity of approx. 12 GB. ...features an even slimmer build than the iPhone 5. It largely follows Apple's design language but manages to remain unique. The front-facing camera has a quite high resolution of 8 megapixels and is suitable for selfies and video chats. The primary camera on the back boasts with a 13 megapixel resolution, auto-focus, and LED flash. 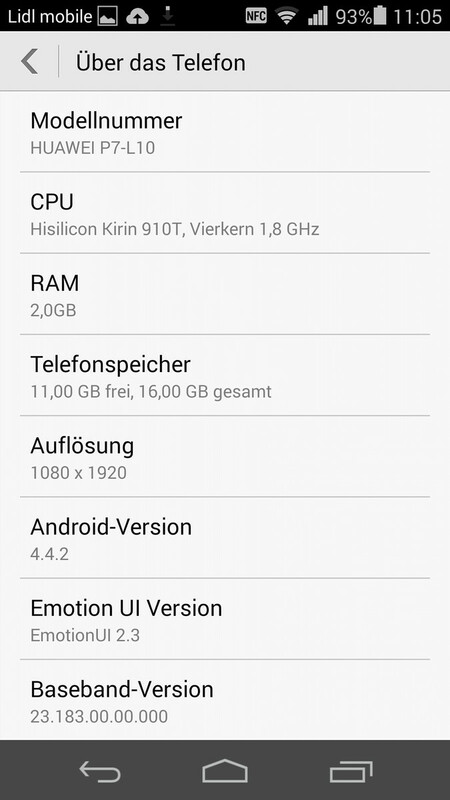 Huawei installs Android 4.4.2 KitKat with its proprietary EmotionUI version 2.3. 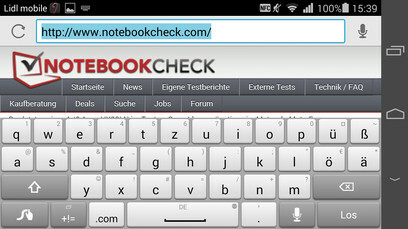 The virtual keyboard has also been slightly modified. 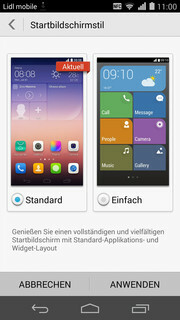 A simplified home screen is available for newcomers. 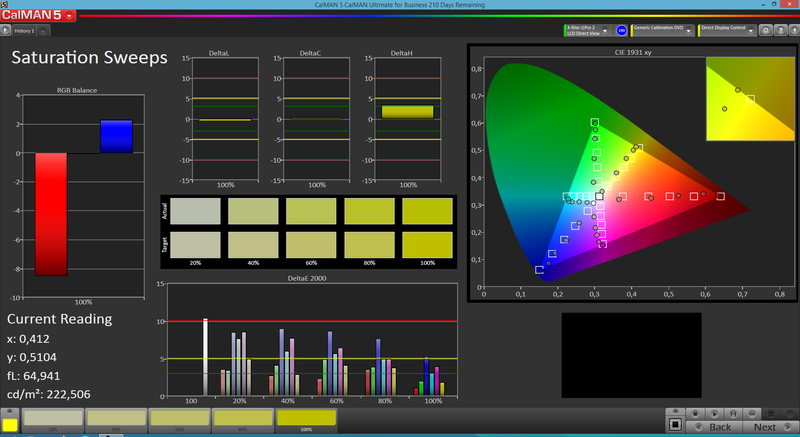 ...allows customizing the color temperature according to the user's preferences. Unfortunately, the virtual Android system buttons reduce the screen's size a bit. Huawei offers free backgrounds to suit any taste. The P7 provides diverse energy-saving options. ...supplies an adequate sound quality considering the size. The speaker benefits considerably from sound options, such as the DTS mode. The stylish design and the slim, rigid casing that features a decent build. 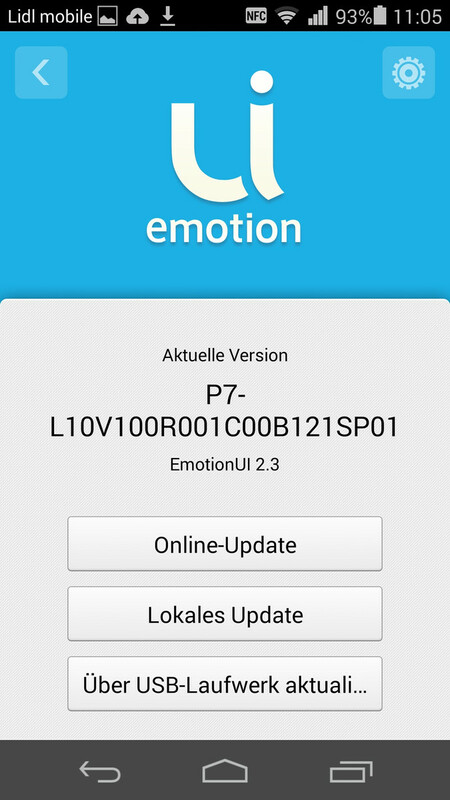 Also, the intuitive EmotionUI 2.3 and the latest Android 4.4.2. 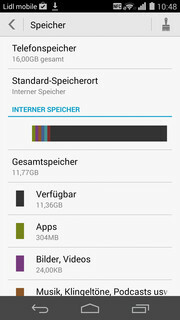 The configuration with a large flash storage and LTE is just as great. A bit more power and faster Wi-Fi. 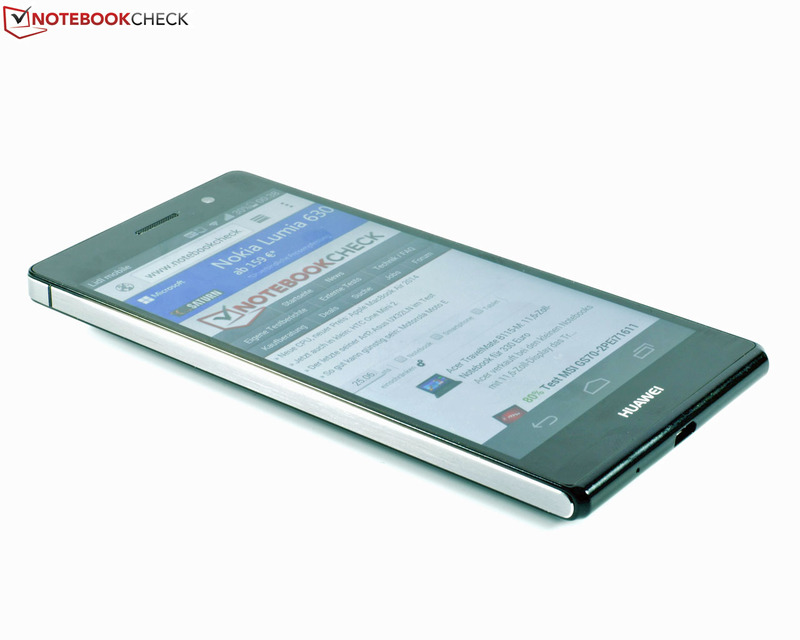 That Huawei manages to unhinge the competition with its Ascend P7.